CpG islands are gene regulatory elements associated with the majority of mammalian promoters, yet how they regulate gene expression remains poorly understood. Here, we identify FBXL19 as a CpG island-binding protein in mouse embryonic stem (ES) cells and show that it associates with the CDK-Mediator complex. We discover that FBXL19 recruits CDK-Mediator to CpG island-associated promoters of non-transcribed developmental genes to prime these genes for activation during cell lineage commitment. We further show that recognition of CpG islands by FBXL19 is essential for mouse development. Together this reveals a new CpG island-centric mechanism for CDK-Mediator recruitment to developmental gene promoters in ES cells and a requirement for CDK-Mediator in priming these developmental genes for activation during cell lineage commitment. Multicellular development relies on the formation of cell-type-specific gene expression programmes that support differentiation. At the most basic level, these expression programmes are defined by cell signaling pathways that control how transcription factors bind DNA sequences in gene regulatory elements and shape RNA polymerase II (RNAPolII)-based transcription from the core gene promoter (reviewed in [Spitz and Furlong, 2012]). In eukaryotes, the activity of RNAPolII is also regulated by a large multi-subunit complex, Mediator, which can directly interact with transcription factors at gene regulatory elements and with RNAPolII at the gene promoter to modulate transcriptional activation. The Mediator complex functions through regulating pre-initiation complex formation and controlling how RNAPolII initiates, pauses, and elongates. Therefore, Mediator is central to achieving appropriate transcription from gene promoters (reviewed in [Allen and Taatjes, 2015; Malik and Roeder, 2010]). In mammalian genomes, CpG dinucleotides are pervasively methylated and this epigenetically maintained DNA modification is generally associated with transcriptional inhibition, playing a central role in silencing of repetitive and parasitic DNA elements (Klose and Bird, 2006; Schübeler, 2015). Most gene promoters, however, are embedded in short elements with elevated CpG dinucleotide content, called CpG islands, which remain free of DNA methylation (Bird et al., 1985; Illingworth and Bird, 2009; Larsen et al., 1992). Interestingly, mammalian cells have evolved a DNA-binding domain, called a ZF-CxxC domain, which can recognize CpG dinucleotides when they are non-methylated (Lee et al., 2001; Voo et al., 2000). This endows ZF-CxxC domain-containing proteins with the capacity to recognize and bind CpG islands throughout the genome (Blackledge et al., 2010; Thomson et al., 2010). There are 12 mammalian proteins encoding a ZF-CxxC domain, most of which are found in large chromatin modifying complexes that post-translationally modify histone proteins to regulate gene expression from CpG islands (Long et al., 2013a). This has led to the proposal that CpG islands may function through chromatin modification to affect transcription (Blackledge et al., 2013). One of the first characterised ZF-CxxC domain-containing proteins was lysine-specific demethylase 2A (KDM2A) (Blackledge et al., 2010). KDM2A is a JmjC-domain-containing histone lysine demethylase that removes histone H3 lysine 36 mono- and di- methylation (H3K36me1/2) from CpG islands (Blackledge et al., 2010; Tsukada et al., 2006). Like DNA methylation, H3K36me1/me2 is found throughout the genome and is thought to be repressive to gene transcription (Carrozza et al., 2005; Keogh et al., 2005; Peters et al., 2003). Therefore, it was proposed that KDM2A counteracts H3K36me2-dependent transcriptional inhibition at CpG island-associated gene promoters (Blackledge et al., 2010). Sequence-based homology searches revealed that KDM2A has two paralogues in vertebrates, KDM2B and FBXL19 (Katoh and Katoh, 2004). KDM2B, like KDM2A, binds to CpG islands and can function as a histone demethylase for H3K36me1/2 via its JmjC domain (Farcas et al., 2012; He et al., 2008). However, unlike KDM2A, it physically associates with the polycomb repressive complex 1 (PRC1) to control how transcriptionally repressive polycomb chromatin domains form at a subset of CpG island-associated genes (Blackledge et al., 2014; Farcas et al., 2012; He et al., 2013; Wu et al., 2013). These observations have suggested that, despite extensive similarity between KDM2A and KDM2B and some functional redundancy in histone demethylation, individual KDM2 paralogues have evolved unique functions. FBXL19 remains the least well characterized and most divergent of the KDM2 paralogues. Unlike KDM2A and KDM2B, it lacks a JmjC domain and, therefore, does not have demethylase activity (Long et al., 2013a). Previous work on FBXL19 has suggested that it plays a role in a variety of cytoplasmic processes that affect cell proliferation, migration, apoptosis, TGFβ signalling, and regulation of the innate immune response (Dong et al., 2014; Wei et al., 2013; Zhao et al., 2013; Zhao et al., 2012). More recently, it has also been proposed to have a nuclear function as a CpG island-binding protein (Lee et al., 2017), but its role in the nucleus still remains poorly defined. Here, we investigate the function of FBXL19 in mouse embryonic stem (ES) cells and show that it is predominantly found in the nucleus where it localizes in a ZF-CxxC-dependent manner to CpG island promoters. Biochemical purification of FBXL19 revealed an association with the CDK-containing Mediator complex and we discover that FBXL19 can target CDK-Mediator to chromatin. Conditional removal of the CpG island-binding domain of FBXL19 in ES cells leads to a reduction in the occupancy of CDK8 at CpG islands associated with inactive developmental genes. FBXL19 and CDK-Mediator appear to play an important role in priming genes for future expression, as these genes are not appropriately activated during ES cell differentiation when the CpG island-binding capacity of FBXL19 is abolished or CDK-Mediator is disrupted. Consistent with an important role for FBXL19 in supporting normal developmental gene expression, removal of the ZF-CxxC domain of FBXL19 leads to perturbed development and embryonic lethality in mice. Together, our findings uncover an interesting new mechanism by which CDK-Mediator is recruited to gene promoters in ES cells and demonstrate a requirement for FBXL19 and CDK-Mediator in priming developmental gene expression during cell lineage commitment. FBXL19 shares extensive sequence similarity and domain architecture with the other KDM2 paralogues which are predominantly nuclear proteins (Figure 1A, [Blackledge et al., 2010; Farcas et al., 2012]), yet the function of FBXL19 has largely been described in the context of cytoplasmic processes (Dong et al., 2014; Wei et al., 2013; Zhao et al., 2013; Zhao et al., 2012). Therefore, we first examined the subcellular distribution of FBXL19 to understand whether it was unique amongst KDM2 paralogues in localizing to the cytoplasm. To achieve this, we generated a mouse ES cell line expressing epitope-tagged FBXL19 (FS2-FBXL19) and carried out immuno-fluorescent staining. This revealed that FBXL19 was almost exclusively nuclear (Figure 1B). When we carried out subcellular biochemical fractionation, FBXL19 was also enriched in the nuclear fractions in agreement with the immuno-fluorescent staining (Figure 1C). Importantly, FBXL19 was found not only in the soluble nuclear extract but also in the insoluble nuclear pellet, which contains chromatin-bound factors (Figure 1C). This suggested that FBXL19 may associate with chromatin, like other ZF-CxxC domain-containing proteins. FBXL19 binds CpG islands genome-wide via its ZF-CxxC domain. (A) A schematic illustrating KDM2 protein domain architecture. (B) Immuno-fluorescent staining for FS2-FBXL19 in ES cells. (C) ES cell fractionation and Western blot for factors enriched in the nucleus (TBP), the cytoplasm (CUL1), and FS2-FBXL19. Ponceau S staining indicates protein loading. Cyto – cytoplasmic fraction, NE – soluble nuclear extract, NP – insoluble nuclear pellet. The asterisk indicates a non-specific band. (D) Screen shots showing ChIP-seq traces for KDM2B, KDM2A and FS2-FBXL19. BioCAP is included to indicate the location of non-methylated DNA and computationally predicted CpG islands (CGIs) are illustrated above. (E) Heatmaps showing enrichment of KDM2 proteins over a 5 kb region centred on non-methylated islands identified by BioCAP (NMIs) (n = 27698), sorted by decreasing BioCAP signal. BioCAP is shown for comparison. (F) A scatter plot showing the Spearman correlation between FS2-FBXL19 ChIP-seq signal and BioCAP signal at NMIs. (G) A schematic illustrating the FS2-FBXL19 transgenes. (H) A screen shot showing ChIP-seq traces for WT FS2-FBXL19 and ZF-CxxC FS2-FBXL19 mutants as in G. EV indicates empty vector control. (I) A metaplot analysis of WT FS2-FBXL19 and ZF-CxxC FS2-FBXL19 mutants over FBXL19 peaks. Based on the nuclear localization of FBXL19 and the fact that it encodes a highly conserved ZF-CxxC domain (Figure 1—figure supplement 1A), we set out to determine whether FBXL19 is a CpG island-binding protein. To achieve this, we carried out chromatin immunoprecipitation followed by massively parallel sequencing (ChIP-seq) for epitope-tagged FBXL19 and compared its binding profile with those we have previously generated for KDM2A and KDM2B in mouse ES cells (Blackledge et al., 2014; Farcas et al., 2012). A visual examination of FBXL19 ChIP-seq signal revealed that it was highly enriched at both computationally predicted CpG islands and genomic regions that contain BioCAP signal, an experimental measure of non-methylated DNA (Blackledge et al., 2012) (Figure 1D). We then identified all non-methylated CpG islands (NMIs) using BioCAP data (n = 27698) (Long et al., 2013b) and extended our analysis across the genome. We observed that FBXL19 ChIP-seq signal at NMIs was highly similar to that of KDM2A and KDM2B (Figure 1E). Furthermore, FBXL19 ChIP-seq signal correlated well with the density of non-methylated CpG dinucleotides in NMIs, similarly to KDM2A and KDM2B, (Figure 1F and Figure 1—figure supplement 1B,C), and almost all FBXL19-occupied sites fell within NMIs (Figure 1—figure supplement 1D). Together these findings demonstrate that FBXL19 is a nuclear protein that binds to CpG islands, an observation supported by a recent independent study (Lee et al., 2017). KDM2A and KDM2B rely on defined residues in their ZF-CxxC domain to recognize non-methylated cytosine and bind CpG islands (Blackledge et al., 2010; Farcas et al., 2012). To determine whether the association of FBXL19 with CpG islands is dependent on this domain, we generated ES cell lines expressing either a mutant version of FBXL19, in which a key lysine residue was substituted to alanine (K49A, Figure 1—figure supplement 1A) to disrupt the recognition of non-methylated CpGs, or a truncated version of FBXL19, where the ZF-CxxC domain was deleted (ΔCXXC) (Figure 1G). Importantly, the expression levels of wild type (WT) and mutant FBXL19 transgenes were highly similar (Figure 1—figure supplement 1E). We then carried out ChIP-seq for epitope-tagged FBXL19 in these cell lines and compared the binding profiles of the mutant FBXL19 to that of WT FBXL19 (Figure 1H). This revealed a near complete loss of FBXL19 binding to chromatin when the ZF-CxxC domain was deleted and a slightly less dramatic effect in the K49A mutant (Figure 1H,I, and Figure 1—figure supplement 1F,G). Together, these observations demonstrate that binding of FBXL19 to CpG islands relies on an intact and functional ZF-CxxC domain. Our ChIP-seq analyses demonstrated that FBXL19 is targeted to CpG islands in a manner that is highly similar to KDM2A and KDM2B (Figure 1). Although KDM2A and KDM2B localise to the same genomic regions and show a high degree of sequence conservation, they associate with different proteins (Farcas et al., 2012). This raised the interesting possibility that FBXL19 might also have unique interaction partners. To investigate this, we affinity-purified epitope-tagged FBXL19 from ES cell nuclear extract and identified associated proteins by mass spectrometry (AP-MS) (Figure 2A, Figure 2—figure supplement 1A, and Figure 2—source data 1). This revealed that FBXL19 interacts with SKP1, a known F-box-binding protein that also associates with KDM2A and KDM2B (Bai et al., 1996; Farcas et al., 2012), and the nuclear proteasome activator PSME3 (Wójcik et al., 1998). Interestingly, we also identified multiple subunits of the Mediator complex that appeared to interact with FBXL19 in a sub-stoichiometric manner (Figure 2A,B). Biochemical purifications of Mediator have identified two distinct assemblies (Liu et al., 2001; Mittler et al., 2001; Taatjes et al., 2002). The first is characterized by the presence of the MED26 subunit which associates with the middle region of Mediator and this form of the complex interacts with RNAPolII (Näär et al., 2002; Paoletti et al., 2006; Sato et al., 2004; Takahashi et al., 2011). Alternatively, a kinase module, composed of CDK8/CDK19, MED12/12L, MED13/13L, and CCNC, can bind to Mediator in a manner which is mutually exclusive with MED26 (Taatjes et al., 2002). Interestingly, our FBXL19 purification identified subunits of the kinase-containing Mediator complex (CDK-Mediator), but not MED26 or RNAPolII (Figure 2). This suggests that FBXL19 interacts preferentially with CDK-Mediator, however, we cannot exclude the possibly it may also interact with MED26-Mediator. CDK8 and its paralogue CDK19 share 77% amino acid identity (89% similarity) (Audetat et al., 2017; Galbraith et al., 2013; Sato et al., 2004; Tsutsui et al., 2008) and four out of the five peptides identified by mass spectrometry were common between the two proteins (data not shown). Therefore, it is likely that FBXL19 is able to interact with both CDK8- and CDK19-containing Mediator complexes. Importantly, interaction with CDK-Mediator was also evident when we performed affinity-purification of endogenous FBXL19 (Figure 2—figure supplement 1B–D). However, reciprocal immunopurifications of MED12 and CDK8 failed to yield detectable FBXL19 by western blot (Figure 2—figure supplement 1D). This is in agreement with our mass spectrometry analysis, which indicated that the association of FBXL19 with CDK-Mediator is sub-stoichiometric, and suggests that this interaction is likely weak, as opposed to stable, inside cells. FBXL19 interacts with the CDK-Mediator complex in ES cells. (A) A heatmap representing the empirically modified protein abundance index (emPAI) of identified FBXL19-interacting proteins by affinity purification mass spectrometry (AP-MS). Data shown is an average of two biological replicates. The location of the identified Mediator components within the holocomplex is summarised on the right and in (B). (B) A schematic representation of the identified FBXL19-interacting proteins. Subunits of the CDK-Mediator complex not identified by AP-MS are shown in white. (C) Western blot analysis of FS2-FBXL19 and control purifications (EV) probed with the indicated antibodies. We next wanted to determine which region of FBXL19 is required for interaction with CDK-Mediator. To do so, we transiently expressed full length FBXL19 or versions of FBXL19 with individual domains removed and performed affinity purification followed by western blot analysis. Intact FBXL19 and a version with the ZF-CxxC domain removed interacted with CDK-Mediator, whereas removing the F-box domain resulted in a loss of this interaction (Figure 2—figure supplement 1E). Therefore, FBXL19 relies on its F-box, and not its capacity to bind non-methylated DNA, for its association with CDK-Mediator. Based on a candidate approach, it was recently reported that FBXL19 could interact the RNF20/40 E3 ubiquitin ligase in ES cells and regulate histone H2B lysine 120 ubiquitylation (H2BK120ub1) (Lee et al., 2017). In our unbiased biochemical purification of FBXL19, we did not identify an interaction with RNF20/40 by AP-MS or by western blot analysis (Figure 2A and Figure 2—figure supplement 1F). Furthermore, we failed to observe any relationship between the ability of FBXL19 to associate with CpG islands and the levels of H2BK120ub1 (Figure 2—figure supplement 1G). Therefore, the relevance of this proposed interaction remains unclear. FBXL19 contains conserved F-box and leucine-rich repeat (LRR) domains. F-box proteins are known to function as scaffolds and substrate recognition modules for the SKP1-Cullin-F-box (SCF) protein complexes that ubiquitylate proteins for degradation by the proteasome (Skaar et al., 2014; Skowyra et al., 1997). Based on the association of FBXL19 with SKP1 and PSME3, we speculated that FBXL19 might function as a SCF substrate-selector for CDK-Mediator, as has previously been observed for the related F-box-containing protein FBW7 (Davis et al., 2013). Interestingly, however, in our FBXL19 purifications, we did not detect the SCF complex components CUL1 and RBX1/2, which are required for ubiquitin E3 ligase activity (Skaar et al., 2014) (Figure 2A). Nevertheless, we investigated in more detail whether FBXL19 might regulate CDK-Mediator protein levels. Treatment of ES cells with the proteasome inhibitor MG132, which sequesters SCF substrates on their substrate selector, did not lead to elevated levels of Mediator subunits in FBXL19 purifications as identified by AP-MS (unpublished observation). In addition, transient overexpression of FBXL19 did not cause an appreciable reduction in CDK-Mediator protein (Figure 2—figure supplement 1H). Based on these observations, we conclude that FBXL19 does not function as a SCF substrate selector for CDK-Mediator. This raised the interesting possibility that FBXL19 may function in a proteasome-independent manner with CDK-Mediator at CpG islands. It has previously been shown that transcription factors can recruit the Mediator complex to enhancers and gene promoters (Poss et al., 2013), yet the complement of mechanisms by which Mediator is targeted to chromatin remains very poorly defined. Given that FBXL19 does not appear to regulate CDK-Mediator protein levels, we hypothesized that it might instead function to recruit CDK-Mediator to chromatin. To test this possibility, we took advantage of a synthetic system we have developed to nucleate proteins de novo on chromatin and test their capacity to recruit additional factors (Blackledge et al., 2014). Fusion of the Tet repressor DNA-binding domain (TetR) to FBXL19 allowed the recruitment of FBXL19 to a short array of Tet repressor DNA binding sites (TetO), engineered into a single site on mouse chromosome 8 ([Blackledge et al., 2014], Figure 3A). To determine whether FBXL19 was sufficient to recruit CDK-Mediator to chromatin, we stably expressed TetR or the TetR-FBXL19 fusion protein in the TetO array-containing ES cell line (Figure 3—figure supplement 1A). We then carried out ChIP for CDK-Mediator subunits (Figure 3B). Consistent with our biochemical observations (Figure 2), when we examined the binding of CDK8 and MED12 over the TetO array, we observed an enrichment in the TetR-FBXL19 line. Furthermore, binding of MED4, which is part of the core Mediator complex, was also evident at the TetO array (Figure 3B). This suggests that FBXL19 may be sufficient to recruit a holo-CDK-Mediator complex, in keeping with its biochemical co-purification with multiple components of both the CDK module and core Mediator complex (Figure 2). Importantly, stable expression of TetR-KDM2A and TetR-KDM2B did not lead to CDK8 recruitment, indicating that this activity is unique to FBXL19 (Figure 3—figure supplement 1B). 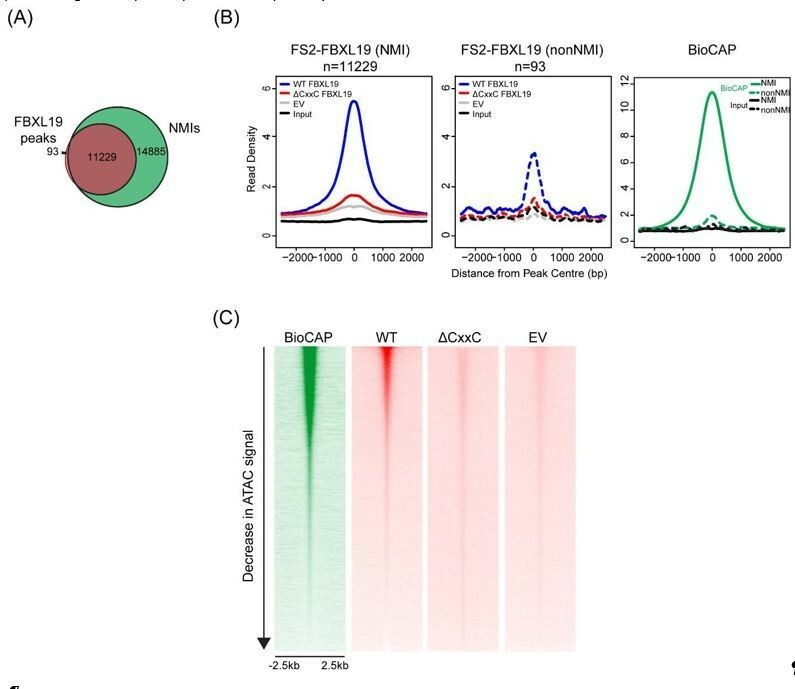 Further work will be required to determine the dynamics with which individual Mediator components are recruited to chromatin by FBXL19 as well as the precise composition of such complexes. Together these observations demonstrate that FBXL19 interacts specifically with the CDK-Mediator and can recruit this complex de novo to chromatin. FBXL19 recruits CDK-Mediator to chromatin. (A) A schematic representation of the integration site of the TetO array. (B) ChIP-qPCR analysis of the binding of the indicated proteins across the TetO array in TetR only (top) and TetR-FBXL19 (bottom) ES cell lines. The x-axis indicates the spatial arrangement of the qPCR amplicons with respect to the center of the TetO array (in kb). Error bars represent SEM of three biological replicates. FBXL19 binds specifically to CpG islands (Figure 1) and can recruit CDK-Mediator to an artificial binding site on chromatin (Figure 3). This raised the interesting possibility that FBXL19 may help to recruit CDK-Mediator to CpG islands in ES cells. To examine this, we first performed CDK8 ChIP-seq in ES cells and compared it to FBXL19 ChIP-seq. Unlike FBXL19, CDK8 occupancy was not restricted to CpG islands (Figure 4—figure supplement 1A), with only 67.5% of CDK8 peaks overlapping with NMIs and CDK8 binding showing a limited correlation with BioCAP signal (Spearman correlation – 0.48, Figure 4—figure supplement 1B). This is in line with previous studies demonstrating that the Mediator complex is recruited to both enhancers and gene promoters (Kagey et al., 2010; Malik and Roeder, 2010). Interestingly, however, we observed enrichment of CDK8 at FBXL19 peaks (Figure 4—figure supplement 1C) with 89.4% of FBXL19 peaks overlapping with CDK8 peaks and NMIs (Figure 4—figure supplement 1D) raising the possibility that FBXL19 may contribute to its occupancy at these sites. To directly test this, we developed an ES cell system in which the exon encoding the ZF-CxxC domain of FBXL19 is flanked by loxP sites (Fbxl19fl/fl) (Figure 4—figure supplement 1E) and which expresses tamoxifen-inducible ERT2-Cre recombinase. Upon addition of tamoxifen (OHT), the ZF-CxxC-encoding exon is excised, yielding a form of FBXL19 that lacks the ZF-CxxC domain (FBXL19ΔCXXC) (Figure 4A,B, and Figure 4—figure supplement 1F) and can, therefore, no longer bind CpG islands (Figure 1). This model cell system allows us to specifically examine the CpG island-associated functions of FBXL19 without affecting its other proposed roles (Dong et al., 2014; Wei et al., 2013; Zhao et al., 2013; Zhao et al., 2012). Following removal of the ZF-CxxC domain of FBXL19, we observed some reductions in FBXL19 protein levels (Figure 4B), but importantly CDK8 levels were unaffected (Figure 4—figure supplement 1G). Using this conditional Fbxl19ΔCXXC ES cell line, we then examined CDK8 occupancy on chromatin by ChIP-seq before and after OHT treatment. Genome-wide profiling of CDK8 in Fbxll19ΔCXXC ES cells did not reveal widespread alterations in CDK8 binding (Figure 4C left and Figure 4—figure supplement 1H), indicating that FBXL19 is not the central determinant driving CDK8 recruitment to most of its binding sites in the genome. Intriguingly, however, a more detailed site-specific analysis revealed a subset of CDK8 target sites that displayed significant alteration in CDK8 occupancy (Figure 4C,D, and Figure 4—figure supplement 1H). In keeping with a potential role for FBXL19 in CDK8 recruitment, the majority of the affected sites showed reduced CDK8 binding (n = 783) (Figure 4C). FBXL19 is required for appropriate CDK8 occupancy at a subset of CpG island promoters. (A) A schematic illustrating how addition of OHT (4-hydroxytamoxifen) leads to the generation of Fbxl19ΔCXXC ES cells. (B) Western blot analysis of an OHT-treatment time course in the Fbxl19fl/fl ES cell line. Hours of treatment are shown. FBXL19 protein was C-terminally tagged with a T7 epitope (Figure 2—figure supplement 1B, C) to allow for Western blot detection with an anti-T7 antibody. FBXL19 runs as a doublet that shifts in size following deletion of the CxxC domain. TBP was probed as a loading control. (C) Metaplots showing CDK8 enrichment in Fbxl19fl/fl ES cells (WT) and Fbxl19ΔCXXC ES cells (OHT) at all CDK8 peaks (left), peaks showing decreased CDK8 occupancy (↑, middle) and peaks showing increased CDK8 occupancy (↓, right). The number of total peaks in each group is indicated. p-values denote statistical significance calculated by Wilcoxon rank sum test comparing ChIP-seq read counts between WT and OHT samples across a 1.5-kbp interval flanking the center of CDK8 peaks. (D) Screen shots showing ChIP-seq traces for CDK8 in wild type Fbxl19fl/fl ES cells (WT) and Fbxl19ΔCXXC ES cells (OHT). BioCAP and FS2-FBXL19 tracks are given for comparison. Left – CDK8 peaks showing reduced CDK8 binding in Fbxl19ΔCXXC ES cells; Right – CDK8 peaks showing increased CDK8 binding in Fbxl19ΔCXXC ES cells (indicated with rectangles). (E) Boxplots showing log2 fold change (log2FC) of CDK8 ChIP-seq signal (RPKM) at all CDK8 peaks (n = 24273), and those with reduced CDK8 (n = 783, ↓) and increased CDK8 (n = 379, ↑). p-values were calculated using a Wilcoxon rank sum test. (F) Boxplots showing the size of CDK8 peaks as in (E). p-values were calculated using a Wilcoxon rank sum test. (G) Venn diagrams representing the overlap between CDK8 peaks and super enhancers (SE) at CDK8 peaks as in (E). Percent overlap of all SEs is indicated. (H) A metaplot (left) showing BioCAP enrichment at CDK8 peaks as in (E) and boxplot quantification (right) of BioCAP RPKM levels. p-Values calculated using Wilcoxon rank sum test are indicated. (I) A metalplot (left) showing FS2-FBXL19 enrichment at CDK8 peaks as in (E) and boxplot quantification (right) of FS2-FBXL19 RPKM levels. p-values calculated using Wilcoxon rank sum test are indicated. Upon closer examination of sites with reduced CDK8 occupancy in Fbxll19ΔCXXC ES cells, we discovered that they tended to coincide with broad regions of CDK8 enrichment (Figure 4E,F), a feature often associated with super-enhancers (Whyte et al., 2013). However, a comparison of these sites to the location of super-enhancers in mouse ES cells indicated that these were distinct (Figure 4G). Instead, sites displaying reduction in CDK8 occupancy coincided with broad regions of non-methylated DNA (Figure 4D,H, and Figure 4—figure supplement 1H), tended to be associated with gene promoters (Figure 4—figure supplement 1I), and had elevated levels of FBXL19 (Figure 4I and Figure 4—figure supplement 1H,I,J). Together, these observations suggest that although binding of CDK8 to most of its target sites in the genome is achieved independently of FBXL19, a subset of broad CpG island-associated gene promoters appear to rely on FBXL19 for appropriate CDK8 occupancy. Despite associating widely with CpG island gene promoters, FBXL19 appears to play a very specific role in maintaining appropriate CDK8 occupancy at a particular subset of broad CpG island-associated promoters (Figure 4). We were therefore curious to know whether something distinguishes these gene promoters from other FBXL19-bound promoters, where FBXL19 does not contribute appreciably to CDK8 occupancy (Figure 4—figure supplement 1H). To achieve this, we initially performed gene ontology (GO) analysis (Huang et al., 2009) on the genes with reduced CDK8 levels at their promoters in Fbxl19ΔCXXC ES cells. Interestingly, this revealed that these genes were strongly enriched for developmental processes (Figure 5A) in agreement with our previous discovery that broad CpG islands are an evolutionary conserved feature of developmentally regulated genes (Long et al., 2013b). In contrast, genes associated with an increased binding of CDK8 did not show any significant GO term enrichment (unpublished observation). GO analysis of the genes associated with unchanged CDK8 levels revealed terms for a broad range of basic molecular processes in line with a general role for Mediator in transcriptional regulation (Figure 5—figure supplement 1E). FBXL19 targets CDK8 to promoters of silent developmental genes in ES cells. (A) Gene ontology analysis of genes associated with a decrease in CDK8 binding (n = 673). (B) A boxplot showing expression levels (log2FPKM) of CDK8-bound genes in wild-type ES cells. CDK8-associated genes are divided based on CDK8 binding in Fbxl19ΔCXXC ES cells: all CDK8-bound (n = 15161), reduced CDK8 (n = 673, ↓), and increased CDK8 binding (n = 255, ↑). p-values were calculated using a Wilcoxon rank sum test. (C) A boxplot showing the change in gene expression (log2 fold change) observed by 4sU RNA-seq of CDK8-associated genes (as in B) following RA treatment. p-values were calculated using a Wilcoxon rank sum test. (D) A boxplot comparing gene expression levels (log2FPKM) of all (n = 19310) and FBXL19-bound (FBXL19+, n = 11368) genes separated by low (all genes n = 7417; FBXl19+ genes n = 2031) and high expression levels (all genes n = 11893, FBXl19+ genes n = 9337) in ES cells (based on Figure 5—figure supplement 1B). (E) A boxplot showing CDK8 enrichment at all and FBXL19-bound genes separated by expression level as in (D). (F) A boxplot showing change in CDK8 binding at the TSSs of all and FBXL19-bound genes divided by expression level as in (D). p-values were calculated using a Wilcoxon rank sum test. In pluripotent mouse ES cells, many developmental genes are inactive and only become expressed as cells commit to more differentiated lineages (Boyer et al., 2006). Importantly, the genes that exhibited reductions in CDK8 binding in Fbxl19ΔCXXC cells were expressed at significantly lower levels than most other genes in ES cells (Figure 5B). Previous work has identified a subset of poised but inactive developmental genes in ES cells that are proposed to exist in a bivalent chromatin state characterized by the co-occurrence of histone H3 lysine 4 and 27 methylation (H3K4/K27me) (Bernstein et al., 2006; Mikkelsen et al., 2007). Therefore, we examined whether sites that rely on FBXL19 for normal CDK8 binding also corresponded to bivalent regions in ES cells. We found that these regions are enriched for H3K27me3 (Figure 5—figure supplement 1A) and have elevated H3K4me3 compared to other H3K27me3-modified sites that lack CDK8 (Figure 5—figure supplement 1B). Therefore, sites that rely on FBXL19 for normal CDK8 binding and correspond to silent developmental gene promoters are also bivalent. To ask whether these genes are induced during cell lineage commitment, we compared their expression levels in ES cells and following retinoic acid (RA) treatment which induces differentiation (Figure 6—figure supplement 1B,C). This clearly demonstrated that the genes which rely on FBXL19 for appropriate CDK8 binding in the ES cell state can become transcriptionally activated during stem cell lineage commitment (Figure 5C). The observation that FBXL19 appears to be important for CDK8 occupancy at largely inactive genes was intriguing given that previous work characterizing Mediator function has usually focussed on its activity at actively transcribed or induced genes (reviewed in [Poss et al., 2013]). We therefore set out to examine the relationship between FBXL19, CDK8 and gene expression in more detail. We first separated all promoters based on expression of their associated genes (Figure 5D and Figure 5—figure supplement 1D). We observed that CDK8 occupancy was in general linked to gene activity (Figure 5E), in agreement with previous reports (Alarcón et al., 2009; Bancerek et al., 2013; Donner et al., 2010; Donner et al., 2007; Fryer et al., 2004; Galbraith et al., 2013). However, at FBXL19-bound gene promoters, CDK8 occupancy was similar in both the lowly and highly expressed subsets of genes (Figure 5E). Importantly, CDK8 occupancy at promoters of lowly expressed genes was reduced in Fbxl19ΔCXXC ES cells (Figure 5F). Therefore, these observations reveal that CDK8 is enriched at promoters of inactive or lowly expressed genes in ES cells and its binding is dependent on recognition of CpG islands by FBXL19. FBXL19 appears to play a role in recruiting CDK8 to a class of genes that are repressed in the ES cell state and become activated during cell linage commitment (Figure 5). However, it remained unclear whether FBXL19 is required for the activation of these developmental genes. To address this question, we induced differentiation of Fbxl19fl/fl and Fbxl19ΔCXXC ES cells with RA (Figure 6A) and compared the expression of several genes which showed reduced CDK8 binding in Fbxl19ΔCXXC ES cells (Figure 6B). We observed no significant differences in the expression of these genes in wild-type Fbxl19fl/fl and Fbxl19ΔCXXC ES cells where these genes are silent. Strikingly, however, following RA treatment, Fbxl19ΔCXXC cells failed to induce these genes appropriately (Figure 6B). 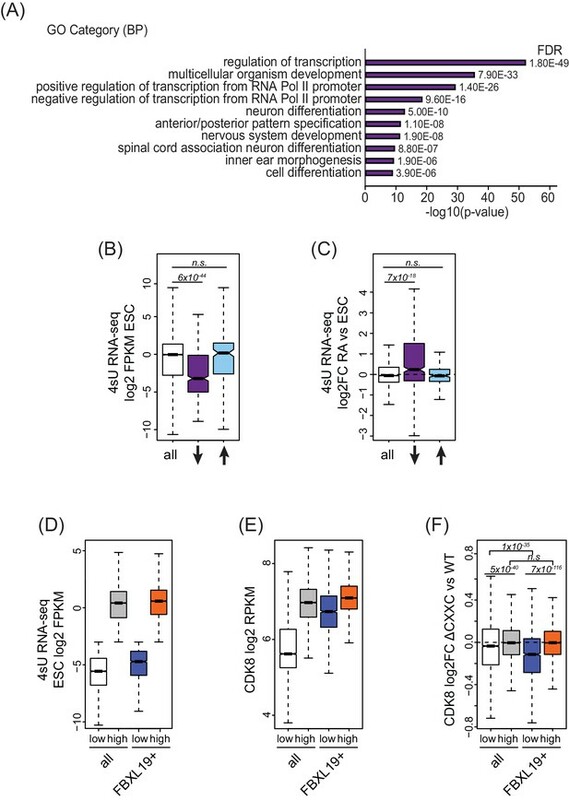 Similarly, developmental genes were not appropriately induced during embryoid body differentiation of Fbxl19ΔCXXC ES cells (Figure 6—figure supplement 1A). Importantly, this demonstrates that FBXL19 is required for the appropriate activation of developmental gene expression during cell lineage commitment. Removing the CpG island-binding domain of FBXL19 results in a failure to induce developmental genes during ES cell differentiation. (A) A schematic illustrating the OHT treatment and differentiation approach. (B) RT-qPCR gene expression analysis of genes showing decreased CDK8 binding in Fbxl19ΔCXXC ES cells before (ESC) and after RA induction. Expression is relative to the average of two house-keeping genes. Error bars show SEM of three biological replicates, asterisks represent statistical significance calculated by Student T-test: *p<0.05, **p<0.01, ***p<0.001. (C) Volcano plots showing differential expression (log2 fold change) comparing WT and Fbxl19ΔCXXC cells in the ES cell (top) and RA-induced state (bottom). Differentially expressed genes (log2FC < −0.5 or log2FC > 0.5, padj <0.1) are shown in red. The number of genes considered to be significantly altered in expression are indicated. (D) Gene ontology analysis of genes with decreased expression in Fbxl19ΔCXXC ES cells following RA treatment (n = 552). (E) A boxplot indicating the expression level (FPKM) based on 4sU RNA-seq in wild-type ES cells of the gene groupings in (C): n.c. genes n = 17869 (no significant change), up genes = 889, down genes = 552. p-values calculated using a Wilcoxon rank sum test are indicated. (F) A boxplot indicating the log2 fold change in gene expression of the gene groupings in (E) upon RA differentiation of ES cells. p-values calculated using a Wilcoxon rank sum test are indicated. (G) A boxplot indicating the change in CDK8 binding (log2FC) at the promoters of the gene groupings in (E) in ES cells. p-values calculated using a Wilcoxon rank sum test are indicated. To understand the extent to which genes are not appropriately induced during differentiation of Fbxl19ΔCXXC ES cells, we examined ongoing transcription in both the ES cell state and after RA-mediated differentiation using short time-scale 4-thiouridine-based labeling and RNA sequencing (4sU RNA-seq) (Figure 6A). We observed a significant number of genes that become induced upon RA treatment in wild-type cells (n = 4051) (Figure 6—figure supplement 1B and Figure 6—source data 1). GO term analysis confirmed that these genes are associated with ES cell differentiation and early embryonic development (Figure 6—figure supplement 1C). We then used differential gene expression analysis to compare transcription in Fbxl19fl/fl and Fbxl19ΔCXXC cells (Figure 6C and Figure 6—source data 1). While very few significant changes in gene expression were observed in the ES cell state, following RA-induced differentiation we identified a large number of genes (n = 552) that had significantly lower expression levels in Fbxl19ΔCXXC cells (Figure 6C). This is consistent with our results when examining individual genes (Figure 6B and Figure 6—figure supplement 1A) and with a recent study where the expression of a selection of genes was examined following FBXL19 knock-down (Lee et al., 2017). GO analysis revealed that the set of genes that were not appropriately activated were associated with genes involved in developmental processes (Figure 6D and Figure 6—source data 1), unlike genes with increased expression (n = 889) which were not associated with these processes (Figure 6—figure supplement 1D and Figure 6—source data 1). It is possible that the observed increases in gene expression in Fbxl19ΔCXXC cells following RA induction result from secondary effects or as of yet unidentified roles of FBXL19 in inhibiting gene expression. Nevertheless, consistent with our analysis of FBXL19-dependent CDK8 occupancy at promoters of developmental genes (Figure 5B,C), genes not appropriately induced were lowly expressed in wild-type ES cells (Figure 6E) and tended to become activated following RA induction (Figure 6F). Importantly, these genes exhibited a reduction in CDK8 binding in Fbxl19ΔCXXC ES cells (Figure 6G and Figure 6—figure supplement 1E), supporting the idea that FBXL19 recruits CDK8 to this subset of CpG island-associated developmental genes and that this may prime these genes for activation during differentiation. Given that FBXL19 is required for CDK8 occupancy at the promoters of a series of silent developmental genes and for their activation during differentiation (Figures 5 and 6), we hypothesized that FBXL19 may prime these genes for future activation through the activity of CDK-Mediator. To address this interesting possibility, we developed a system to conditionally remove MED13 and its closely related paralogue MED13L in ES cells (Med13/13lfl/fl ERT2-Cre ES cells) (Figure 7A and Figure 7—figure supplement 1A). We chose to inactivate MED13/13L as it has previously been shown to physically link the CDK-kinase module to the core Mediator complex and underpin the formation of a functional CDK-Mediator (Knuesel et al., 2009; Tsai et al., 2013). Treatment of the Med13/13lfl/fl ES cells with OHT resulted in a loss of MED13 and MED13L protein (MED13/13L KO) and reduced levels of the other subunits of the CDK-kinase module (Figure 7B). Importantly, removal of MED13/13L also led to a loss of CDK8 binding to chromatin (Figure 7C) but did not have an appreciable effect on the expression of FBXL19 target genes in the ES cell state (Figure 7D). 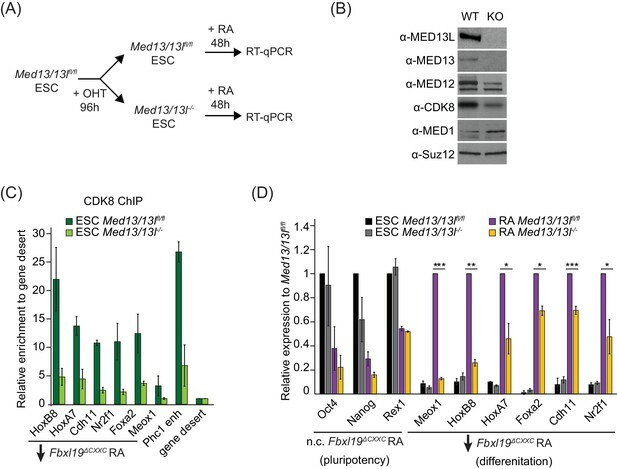 We next induced differentiation of the MED13/13L KO cells with RA (Figure 7A). Importantly, when we then analysed the expression of a series of genes that rely on FBXL19 for activation during differentiation (Figure 7D), we observed that these genes also failed to appropriately induce in MED13/13L KO cells (Figure 7D). Together this suggests that FBXL19, via its association with CpG islands, recognises a subset of silent developmental genes in ES cells in order to recruit the CDK-Mediator complex and prime these genes for future activation. FBXL19 target genes rely on CDK-Mediator for activation during differentiation. (A) A schematic illustrating the OHT treatment to generate MED13/13L KO ES cells and differentiation approach. (B) Western blot analysis showing the efficiency of MED13/13 knock-out upon 96 hr OHT treatment of Med13/13lfl/fl ES cells. Suz12 was blotted as a loading control. (C) ChIP-qPCR showing CDK8 enrichment in WT and MED13/13L KO ES cells. Enrichment is relative to gene desert control region. Error bars show standard deviation of two biological replicates. (D) RT-qPCR gene expression analysis in WT and MED13/13L KO ES cells before and after RA induction. Expression was normalized to the expression of the PolIII-transcribed gene tRNA-Lys and is represented as relative to WT ES cells (for pluripotency genes) or RA-treated WT cells (for differentiation markers). Error bars show SEM of three biological replicates, asterisks represent statistical significance calculated by Student T-test: *p<0.05, **p<0.01, ***p<0.001. Our results suggest that FBXL19 contributes to gene activation during cell lineage commitment via recognition of CpG islands and recruitment of the CDK-Mediator complex. Given that Fbxl19ΔCXXC cells display impaired gene activation in our in vitro differentiation model, we asked whether the inability of FBXL19 to bind and function at CpG islands could also affect mouse development. In order to address this, we generated Fbxl19ΔCXXC mutant mice by crossing Fbxl19fl/fl animals with animals constitutively expressing Cre recombinase. From these crosses, we failed to obtain any viable Fbxl19ΔCXXC homozygous offspring, indicating that removal of the ZF-CxxC domain of FBXL19 leads to embryonic lethality (Figure 8A). We then investigated at which stage Fbxl19ΔCXXC homozygous embryos were affected and found homozygous embryos were observed at normal Mendelian ratios until 10.5 days postcoitum (dpc) (Figure 8A). At 9.5 dpc, gross embryonic morphology appeared to be intact but at 10.5 dpc (Figure 8B) the embryos exhibited a clear growth retardation and showed, to varying extents, reduced elongation of the trunk, hypomorphic limb buds and cephalic region. This included undeveloped facial mesenchyme, including defects in maxillary and mandibular components of first branchial arches (indicated by yellow and red arrows in Figure 8B, respectively), and hypomorphic cardiac mesenchyme. Some living Fbxl19ΔCXXC homozygous embryos, characterized by a beating heart, were observed at 12.5 dpc but they were of similar size and external appearance to 10.5 dpc mutant embryos suggesting that normal development had ceased by this point. Together our findings demonstrate that FBXL19, and its ability to recognize CpG islands, is essential for normal mouse embryonic development. Deletion of the ZF-CxxC domain of FBXL19 leads to mouse embryonic lethality. (A) After crossing heterozygotes, the number of live embryos (9.5 dpc or 10.5 dpc) or newborn pups with the indicated genotypes is indicated with the percentages shown in parentheses. (B) The morphological changes in 10.5 dpc Fbxl19CXXCΔ/Δ embryos are indicated. Lateral views of wild-type (wt), together with heterozygous (Fbxl19CXXCΔ/+) and homozygous (Fbxl19CXXCΔ/Δ) mutants are shown. Maxillary and mandibular components of first branchial arches are indicated by yellow and red arrows, respectively. Here, we discover that FBXL19 recognizes CpG islands throughout the genome in a ZF-CxxC-dependent manner (Figure 1). Unlike other ZF-CxxC proteins which associate with chromatin-modifying complexes, we show that FBXL19 interacts with the CDK-Mediator complex (Figure 2). This uncovers an unexpected link between CpG islands and a complex that regulates gene expression through interfacing with the transcriptional machinery. We demonstrate that FBXL19 can recruit CDK-Mediator to chromatin (Figure 3) and, via recognition of CpG islands, plays an interesting role in supporting CDK8 occupancy at a subset of promoters associated with developmental genes, which are inactive in ES cells (Figure 4 and Figure 5). At these CpG islands, FBXL19 and CDK-Mediator function to prime the associated genes for activation during ES cell differentiation (Figure 6 and Figure 7). 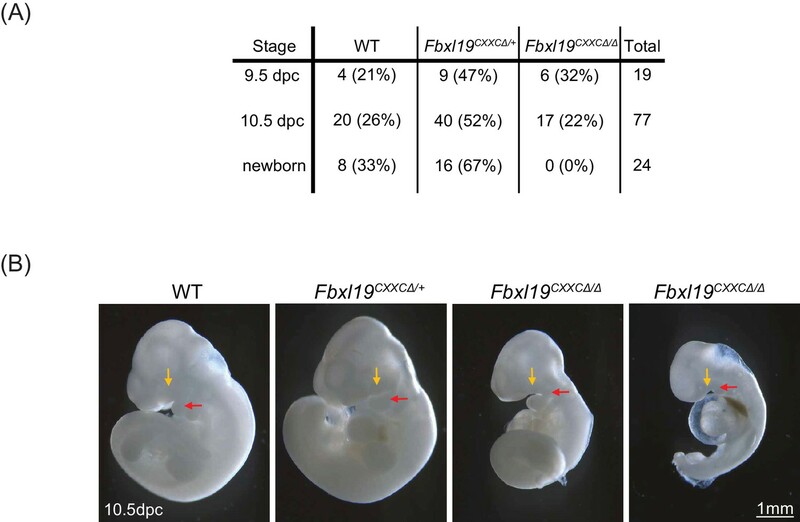 Consistent with an important role of FBXL19 in supporting normal developmental gene expression, removal of the ZF-CxxC domain of FBXL19 leads to perturbed development and embryonic lethality in mice (Figure 8). Together these new discoveries reveal that CpG islands and FBXL19 can interface with CDK-Mediator to orchestrate normal gene expression during lineage commitment. Previously, another F-box protein, FBW7, was shown to function as an E3 ubiquitin ligase substrate selector for the MED13/13L subunit of CDK-Mediator and to regulate its stability through proteasomal degradation (Davis et al., 2013). By controlling CDK-Mediator abundance, one could envisage how this might shape Mediator function in gene expression. FBXL19 also encodes an F-box domain and associates with SKP1, a central component of SCF E3 ubiquitin ligase complexes. However, we do not find evidence that FBXL19 regulates CDK-Mediator stability via the proteasome (Figure 2—figure supplement 1H). Instead, we discover that FBXL19 can recruit CDK-Mediator to chromatin and, more specifically, to CpG islands via its ZF-CxxC domain to support gene activation. Although we currently do not know the defined subunits and surfaces in CDK-Mediator that FBXL19 interacts with, our biochemical experiments indicate that this relies on an intact F-box domain in FBXL19 (Figure 2—figure supplement 1E). It is tempting to speculate that FBXL19 could interact directly with MED13/13L given their recognition by the related F-box protein, Fbw7 (Davis et al., 2013). Nevertheless, a key observation in our work is that FBXL19 appears to have functionally diverged from other F-box proteins during vertebrate evolution by acquiring a DNA-binding domain that allows it to recruit proteins to chromatin, instead of targeting them for ubiquitylation. This general feature is shared with the FBXL19 paralogue, KDM2B, which associates with and recruits the PRC1 complex to CpG islands (Farcas et al., 2012; He et al., 2013; Wu et al., 2013). In agreement with our observations, a large-scale proteomics screen previously suggested that an interaction between FBXL19 and Mediator may also exist in cancer cells (Tan et al., 2013). Given that CDK8 can function as an oncogene (Adler et al., 2012; Firestein et al., 2008; Morris et al., 2008), it will be interesting to understand whether FBXL19 plays a role in targeting CDK-Mediator to CpG islands in non-embryonic tissues, and whether this activity may promote CDK8-driven tumorigenesis. Individual Mediator subunits have been shown to interact with DNA-binding transcription factors that recruit the Mediator complex to specific DNA sequences in regulatory elements and support gene expression (Black et al., 2006; Blazek et al., 2005; Fondell et al., 1996; Malik and Roeder, 2010). In part, Mediator is thought to achieve this by bridging enhancer elements to the core gene promoter and RNAPolII (Allen and Taatjes, 2015; Jeronimo et al., 2016; Petrenko et al., 2016). However, in mammals these proposed mechanisms are extrapolated from studying only a subset of transcription factors and genes. Therefore, the defined mechanisms that shape Mediator occupancy on chromatin remain very poorly understood. Here, we provide evidence for a completely new gene promoter-associated CDK-Mediator targeting mechanism that relies on FBXL19 and CpG island recognition. Surprisingly, although FBXL19 localizes broadly to CpG islands throughout the genome (Figure 1), we only observed a reliance on FBXL19 for CDK8 binding at a subset of sites (Figure 4). Similarly, KDM2B binds broadly to CpG islands, yet has a specificity in shaping PRC1 recruitment and polycomb repressive chromatin domain formation at a subset of developmental genes in mouse ES cells (Farcas et al., 2012). We have previously suggested that this could result from ZF-CxxC domain-containing proteins broadly sampling CpG islands, with their activity or affinity for certain sites being shaped by local gene activity or chromatin environment (Klose et al., 2013). In keeping with these general ideas, FBXL19 is required for appropriate CDK8 binding at bivalent genes in ES cells (Figure 5—figure supplement 1A,B). In future work, it will be important to understand whether this unique chromatin state and/or the absence of transcriptional activity at these sites define the requirement for FBXL19 in CDK8 recruitment, or whether FBXL19 targeting occurs at most CpG islands sites but is masked through redundancy with transcription factor and gene activity-dependent targeting modalities. Historically, CDK-Mediator has been associated with gene repression (Akoulitchev et al., 2000; Chi et al., 2001; Elmlund et al., 2006; Hengartner et al., 1998; Knuesel et al., 2009; Pavri et al., 2005). Therefore, we were not surprised to observe that CDK8 occupied the promoters of repressed developmental genes in ES cells. While abrogating the CpG island-binding activity of FBXL19 or deletion of MED13/13L resulted in reduced CDK8 binding at these sites, it did not lead to an appreciable effect on gene expression in the ES cell state (Figure 6 and Figure 6—figure supplement 1C,D). This suggests that CDK-Mediator is not required for the repression of these genes in ES cells. Instead, these genes fail to properly activate during differentiation (Figure 6, Figure 6—figure supplement 1, and Figure 7D). These observations are in line with several reports that support the idea that CDK-Mediator is also involved in gene activation (Alarcón et al., 2009; Donner et al., 2007; Hirst et al., 1999; Donner et al., 2010; Galbraith et al., 2013). Therefore, in the context of mouse ES cells, we propose that CDK-Mediator may be required to prime silent developmental genes for future gene activation through a mechanism that relies on the recognition of CpG island promoters by FBXL19. This priming could contribute to gene activation during differentiation through one of the several mechanisms by which CDK-Mediator has been proposed to affect gene transcription, including regulating RNAPolII pre-initiation complex assembly, polymerase pausing/elongation, or through mediating long range interactions with distal regulatory elements (Allen and Taatjes, 2015; Belakavadi and Fondell, 2010; Donner et al., 2010; Galbraith et al., 2013; Kagey et al., 2010). Clearly, understanding the defined mechanism by which FBXL19-dependent CDK-Mediator recruitment supports normal gene activation during differentiation remains an important question for future work. Our finding that FBXL19 can target CDK8 to gene promoters and that this is required to prime the expression of developmental genes during ES cell differentiation is conceptually reminiscent of recent work in yeast and human systems which suggested that CDK8 is required for appropriate re-induction of inducible genes following an initial activation stimulus (D'Urso et al., 2016). In this study, CDK8 was found to associate with the promoters of inducible genes following initial activation, even in the absence of appreciable ongoing gene transcription, thereby acting as a form of transcriptional memory (D'Urso et al., 2016). Interestingly, this requirement for CDK8 in normal gene activation appears shared in the context of our developmental gene induction paradigm. However, we find that, in the case of developmental genes, previous gene activation may not be required for the recruitment of CDK8. Instead, this could be achieved by FBXL19 directly recognising and targeting CDK8 to CpG islands. Therefore, we prefer to view this as priming as opposed to memory. Nevertheless, collectively these observations point to an important role for CDK-Mediator binding to gene promoters prior to activation and as a way of supporting subsequent gene induction. This provides new evidence that the roles of CDK-Mediator in gene regulation are more complicated than simply conveying activation signals to RNAPolII through recruitment by transcription factors and suggests the complex may have evolved to play a unique role in regulating gene expression in stem cells and during development. Mouse ES cells were cultured on gelatine-coated dishes in DMEM (Thermo Fisher scientific) supplemented with 15% fetal bovine serum (BioSera), L-Glutamine, beta-mercaptoethanol, non-essential amino acids, penicillin/streptomycin (Thermo Fisher scientific) and 10 ng/mL leukemia-inhibitory factor. Fbxl19fl/fl ES cells were treated with 800 nM 4-hydroxytamoxifen (Sigma) for 96 hr in order to delete the ZF-CxxC domain. For RA differentiation of ES cells, 2.5 × 104 cells/cm2 were allowed to attach to gelatinised dishes (~12 hr) and treated with 1 µM retinoic acid (Sigma-Aldrich) in EC-10 medium (DMEM supplemented with 10% fetal bovine serum, L-Glutamine, beta-mercaptoethanol, non-essential amino acids and penicillin/streptomycin) for 72 hr. For embryonic body differentiation, 2 × 106 cells were plated on non-adhesive 10 cm dishes in EC-10 medium and cultured for the indicated days. For generation of stable cell lines, E14 ES cells were transfected using Lipofectamine 2000 (Thermo Fisher scientific) following manufacturer’s instructions. Stably transfected cells were selected for 10 days using 1 μg/ml puromycin and individual clones were isolated and expanded in the presence of puromycin to maintain the transgene expression. TOT2N E14 cells used for TetR targeting experiments were previously described (Blackledge et al., 2014). 293 T cells were cultured in EC-10 media. Transient overexpression of FBXL19 was performed by transfecting 293 T cells using Lipofectamine 2000 (Thermo Fisher scientific) followed by selection with 400 ng/μl G418 for 48 hr. Proteasome inhibition was performed for 4 hr using 10 µM MG132 inhibitor (Sigma-Aldrich). All cell lines generated and grown in the Klose and Koseki labs were routinely tested for mycoplasma infection. The targeting construct was generated from C57BL6/J mouse genomic sequence spanning mm9 chromosome 7: 134,888,487–134,895,358 containing the exons 1 to 6 of Fbxl19 genomic region. Recombination was carried out by Gateway system (Life Technologies). One of the loxP sequences was inserted at mm9 chr7:134,891,537, and FRT flanked PGK-neo was inserted at mm9 chr7:134,892,000 together with an additional loxP sequence. The targeting construct was electroporated into M1 ES cells to obtain targeted insertion. Clones of targeted ES cells were aggregated with eight-cell embryos to generate the targeted mouse line. The Fbxl19fl/fl line was generated by removal of the PGK-neo marker gene by mating the targeted mice with mice expressing FLP recombinase. These Fbxl19fl/fl mice were further mated with mice harboring the ROSA26-CreErt2 locus to generate Fbxl19fl/fl:ROSA26-CreErt2+/- mice, from which the Fbxl19fl/fl ES cells used in this study were derived. In order to generate a conditional Med13/13lfl/fl ES cell line, we inserted loxP sites downstream of exons 7 and upstream of exons 8 of the Med13 and Med13l genes. The targeting constructs for the insertion of each loxP site were designed to have 150 bp homology arms flanking the loxP site and to carry a mutated PAM sequence to prevent retargeting by the Cas9 enzyme. The targeting constructs were purchased from GeneArt Gene Synthesis (Thermo Fisher scientific). The pSpCas9(BB)−2A-Puro(PX459)-V2.0 vector was obtained by Addgene (#62988). sgRNAs were designed to specifically target the desired genomic region for each loxP insertion (http://crispor.tefor.net/crispor.py) and were cloned into the Cas9 vector as previously described (Ran et al., 2013). ES cells that express the ERT2-Cre recombinase from the ROSA26 locus (ROSA26:ERT2-Cre) were used. First, the downstream loxP sites for Med13 and Med13l were targeted. ROSA26:ERT2-Cre ES cells were transiently co-transfected with 1 μg of each Cas9-sgRNA plasmid and 3.5 μg of each targeting construct using Lipofectamine 3000 (Thermo Fischer Scientific). Successfully transfected ES cells were selected for 48 hr with 1 μg/ml puromycin. Individual clones were screened by genotyping PCR to identify correctly targeted homozygous clones. A clone homozygous for both Med13 and Med13l LoxP1 sites was then used to target the upstream loxP sites using the same transfection protocol and screening strategy. Correct loxP targeting was verified by sequencing of the genomic region surround the loxP sites. For generation of FBXL19 expression constructs, the full length, ΔCxxC or ΔF-box cDNA of mouse Fbxl19 (IMAGE ID 6401846, Source Bioscience) was PCR amplified and inserted into a pCAG-IRES-FS2 vector (Farcas et al., 2012) via ligation-independent cloning (LIC). Mutation of the ZF-CxxC domain of FBXL19 (K49A) was generated via site-directed mutagenesis using the Quikchange mutagenesis XL kit (Stratagene). To generate TetR-FBXL19 fusion expression plasmid, Fbxl19 cDNA was cloned into pCAG-FS2-TetR (Blackledge et al., 2014) via LIC. For transient overexpression in 293 T cells, full length FBXL19 cDNA was cloned into pcDNA3-2xFlag vector by conventional cloning. All plasmids were sequence-verified by sequencing. Cells were harvested by scraping in PBS at 4°C, resuspended in 10x pellet volume (PV) of Buffer A (10 mM Hepes pH 7.9, 1.5 mM MgCl2, 10 mM KCl, 0.5 mM DTT, 0.5 mM PMSF, cOmplete protease inhibitor cocktail (Roche)) and incubated for 10 min at 4°C with slight agitation. After centrifugation, the cell pellet was resuspended in 3x PV Buffer A containing 0.1% NP-40 and incubated for 10 min at 4°C with slight agitation. Nuclei were recovered by centrifugation and the soluble nuclear fraction was extracted for 1 hr at 4°C with slight agitation using 1x PV Buffer C (10 mM Hepes pH 7.9, 400 mM NaCl, 1.5 mM MgCl2, 26% glycerol, 0.2 mM EDTA, cOmplete protease inhibitor cocktail). Protein concentration was measured using Bradford assay. For small-scale co-immunoprecipitation, 600 µg of nuclear extract was diluted in BC150 buffer (50 mM Hepes pH 7.9, 150 mM KCl, 0.5 mM EDTA, 0.5 mM DTT, cOmplete protease inhibitor cocktail). Samples were incubated with the respective antibodies and 25U benzonase nuclease overnight at 4°C. Protein A agarose beads (RepliGen) were blocked for 1 hr at 4°C in Buffer BC150 containing 1% fish skin gelatine (Sigma) and 0.2 mg/ml BSA (NEB). The blocked beads were added to the samples and incubated for 4 hr at 4°C. Washes were performed using BC150 containing 0.02% NP-40. The beads were resuspended in 2x SDS loading buffer and boiled for 5 min to elute the immunoprecipitated complexes. Purification of FBXL19-FS2 was performed using StrepTactin resin (IBA) as previously described with the exception of the wash buffer used (20 mM Tris pH 8.0, 150 mM NaCl, 0.2% NP-40, 1 mM DTT, 5% glycerol, cOmplete protease inhibitor cocktail) (Farcas et al., 2012). Between 10 and 15 mg of nuclear extract was used for each large scale purification. The samples were treated with 75 U/mL benzonase nuclease (Novagen) in order to disrupt nucleic-acid-mediated interactions. Samples from FBXL19-FS2 affinity purifications were subjected to in-solution trypsin digestion and mass spectrometry analysis was performed as described previously (Farcas et al., 2012). Two biological replicates were performed. A control EV purification was included in each replicate. An interaction with identified proteins was only considered significant if absent from the EV data. Antibodies used for IP were rabbit anti-MED12 (A300-774A, Bethyl laboratories), rabbit anti-CDK8 (A302-500A, Bethyl laboratories), rabbit anti-HA (3724, Cell Signaling Technology). A polyclonal antibody against FBXL19 was prepared in-house by rabbit immunisation (PTU/BS Scottish National Blood Transfusion Service) with a recombinant peptide encoding for amino acids 137–336 of mouse FBXL19 protein. The FBXL19 peptide antigen was coupled to Affigel 10 resin (BioRad) and the antibody was affinity-purified and concentrated. Antibodies used for Western blot analysis were mouse anti-Flag M2 (F1804, Sigma-Aldrich), mouse anti-SKP1 (sc-5281, Santa Cruz), goat anti-CDK8 (sc-1521, Santa Cruz), rabbit anti-MED12 (A300-774A, Bethyl laboratories), rabbit anti-MED13L (A302-420A, Bethyl laboratories), rabbit anti-MED13 (GTX129674, Genetex), rabbit anti-MED1, (A300-793A, Bethyl laboratories), rabbit anti-MED26 (A302-370A, Bethyl laboratories), rabbit anti-T7 (13246, Cell Signaling Technology), rabbit anti-TBP (ab818, Abcam), rabbit anti-RNF20 (11974, Cell Signaling Technology), rabbit anti-ubiquityl-Histone H2B (Lys120) (5546, Cell Signaling Technology), and mouse anti-ubiquityl-Histone H2B (Lys120) (05–1312, Millipore). As the FBXL19 antibody failed to work reliably for Western blot analysis, we generated an Fbxl19fl/fl ES cell line in which the endogenous Fbxl19 gene is tagged with a 3xT7-2xStrepII tag by CRISPR/Cas9 knock-in (Figure 2—figure supplement 1B). This allowed us to determine the efficiency of the OHT treatment and endogenous IPs. The tag was synthesised by GeneArt (ThermoFischer Scientific) and the targeting construct was generated by PCR amplification to introduce roughly 150 bp homology arms flanking the 3xT7-2xStrepII tag. The PCR product was cloned into pGEM-T Easy Vector (Promega). The pSpCas9(BB)−2A-Puro vector was obtained by Addgene (#48139). A sgRNA was designed to overlap with the stop codon of the Fbxl19 gene (http://crispr.mit.edu/) and cloned into the Cas9 vector as previously described (Ran et al., 2013). Fbxl19fl/fl ES cells were transiently co-transfected with 1 μg of Cas9-sgRNA plasmid and 3.5 μg of targeting construct using Lipofectamine 3000 (ThermoFischer Scientific). Successfully transfected ES cells were selected for 48 hr with 1 μg/ml puromycin. Individual clones were screened by Western blot and genotyping PCR to identify homozygous targeted clones. Chromatin immunoprecipitation was performed as described previously (Farcas et al., 2012) with slight modifications. Cells were fixed for 45 min with 2 mM DSG (Thermo scientific) in PBS and 12.5 min with 1% formaldehyde (methanol-free, Thermo scientific). Reactions were quenched by the addition of glycine to a final concentration of 125 µM. After cell lysis and chromatin extraction, chromatin was sonicated using a BioRuptor Pico sonicator (Diagenode), followed by centrifugation at 16,000 × g for 20 min at 4°C. 200 µg chromatin diluted in ChIP dilution buffer (1% Triton-X100, 1 mM EDTA, 20 mM Tris-HCl (pH 8.0), 150 mM NaCl) was used per IP. Chromatin was precleared with protein A Dynabeads blocked with 0.2 mg/ml BSA and 50 µg/ml yeast tRNA and incubated with the respective antibodies overnight at 4°C. Antibody-bound chromatin was purified using blocked protein A Dynabeads for 3 hr at 4°C. ChIP washes were performed as described previously (Farcas et al., 2012). ChIP DNA was eluted in ChIP elution buffer (1% SDS, 100 mM NaHCO3) and reversed cross-linked overnight at 65°C with 200 mM NaCl and RNase A (Sigma). The reverse cross-linked samples were treated with 20 μg/ml Proteinase K and purified using ChIP DNA Clean and Concentrator kit (Zymo research). The antibodies used for ChIP experiments were rabbit anti-FS2 (Farcas et al., 2012), rabbit anti-CDK8 (A302-500A, Bethyl laboratories), rabbit anti-MED12 (A300-774A, Bethyl laboratories), mouse anti-MED4 (PRC-MED4-16, DSHB), rabbit anti-SKP1 (12248, Cell Signaling Technology), rabbit anti-KDM2A (Farcas et al., 2012), rabbit anti-KDM2B (Farcas et al., 2012). All ChIP-seq experiments were carried out in biological duplicates. ChIP-seq libraries for FS2-FBXL19 ChIP were prepared using the NEBNext Fast DNA fragmentation and library preparation kit for Ion Torrent (NEB, E6285S) following manufacturer’s instructions. Briefly, 30–40 ng ChIP or input DNA material was used. Libraries were size-selected for 250 bp fragments using 2% E-gel SizeSelect gel (Thermo scientific) and amplified with 6 PCR cycles or used without PCR amplification. Templates were generated with Ion PI Template OT2 200 kit v3 and Ion PI Sequencing 200 kit v3, or with Ion PI IC 200 kit (Thermo scientrific). Libraries were sequenced on the Ion Proton Sequencer using Ion PI chips v2 (Thermo scientific). ChIP-seq libraries for CDK8 ChIP were prepared using the NEBNext Ultra DNA Library Prep Kit, and sequenced as 40 bp paired-end reads on Illumina NextSeq500 platform using NextSeq 500/550 (75 cycles). Total RNA was isolated using TRIzol reagent (Thermo scientific) following manufacturer’s instructions and cDNA was synthesized from 400 ng RNA using random primers and ImProm-II Reverse Transcription system kit (Promega). RT-qPCR was performed using SensiMix SYBR mix (Bioline). Idh1 and Atp6IP1 genes were used as house-keeping controls. For labeling of nascent RNA transcripts, cells were grown in 15 cm culture dishes. Labeling was performed for 20 min at 37°C by the addition of 50 mM 4-thiouridine (T4509, Sigma) to the culture medium. After the incubation, the medium was removed and RNA was isolated using TRIzol reagent (Thermo scientific) following manufacturer’s instructions. The total RNA was treated with TURBO DNA-free kit (Ambion, Thermo scientific) in order to remove contaminating genomic DNA. 300 µg RNA was biotinylated using 600 µg Biotin-HPDP (21341, Pierce, Thermo scientific) in Biotinylation buffer (100 mM Tris-HCl pH 7.4, 10 mM EDTA). The reaction was carried out for one and half hour on a rotor at room temperature. Unincorporated Biotin-HPDP was removed by chloroform/isoamylalcohol (24:1, Sigma) wash followed by isopropanol precipitation of the biotinylated RNA. Labeled biotinylated RNA was isolated using µMacs Streptavidin Kit (130-074-101, Miltenyi) following manufacturer’s instructions and purified using RNeasy MinElute Cleanup kit (Qiagen). The quality of the RNA was confirmed using the RNA pico Bioanalyser kit (Agilent). Up to 1 µg purified 4sU-labelled RNA was used to prepare libraries for 4sU-RNA-seq. Ribosomal RNA was removed using NEBNext rRNA Depletion Kit and libraries were prepared using NEBNext Ultra Directional RNA Library Prep Kit for Illumina (NEB) following manufacturer’s instructions. Library quality was assessed using the High-sensitivity DS DNA Bioanalyser kit (Agilent) and the concentration was measured by quantitative PCR using KAPA Library quantification standards for Illumina (KAPA Biosystems). All 4sU RNA-seq experiments were carried out in biological triplicates. 4sU RNA-seq libraries were sequenced as 80 paired-end reads on Illumina NextSeq500 platform using NextSeq 500/550 High Output Kit v2 (150 cycles). Sequencing reads were aligned to the mouse genome (mm10) using bowtie2 (Langmead and Salzberg, 2012) with the ‘--no-mixed’ and ‘--no-discordant’ options. Reads that mapped more than once to the genome were discarded. For 4sU RNA-seq analysis, rRNA reads were initially removed by aligning the data to mouse rRNA genomic sequences (GenBank: BK000964.3) using bowtie2. The rRNA-depleted reads were next aligned against mm10 genome using the STAR RNA-seq aligner (Dobin et al., 2013). To improve mapping of nascent, intronic sequences, a second alignment step with bowtie2 was included using the reads which failed to map using STAR. PCR duplicates were removed using samtools (Li et al., 2009). Biological replicates were randomly downsampled to the same number of reads for each individual replicate and merged for visualisation. Bigwig files were generated using MACS2 (Zhang et al., 2008) and visualised using the using the UCSC Genome Browser (Raney et al., 2014). Peak calling was performed using the MACS2 function with the ‘-broad’ option using the biological replicates with matched input (Zhang et al., 2008). Peaks mapping to a custom ‘blacklist’ of artificially high genomic regions were discarded. Only peaks called in both replicates were considered. Differential analysis of CDK8 binding was done using DiffReps (Shen et al., 2013) and the called differential regions were overlapped with CDK8 peaks. Changes in binding of log2FC less than −0.5 or more than 0.5 with adjusted p-value below 0.05 were considered significant. Differential expression analysis was performed using the DESeq2 package (Love et al., 2014), version 1.6.3, with R version 3.1.1. Counts were quantified using the summarizeOverlaps() function in R in the mode ‘Union’ and inter.feature = FALSE. Genes with an adjusted p-value of below 0.1 and a fold change of at least 1.5 were considered differentially expressed. Statistical analysis was performed using two-sample Wilcoxon rank sum test. Gene ontology analysis was done using DAVID 6.8 (Huang et al., 2009). For CDK8 differentially bound peaks, all CDK8 peaks were provided as background. For misregulated genes analysis, all RefSeq genes were provided as background. ATAC peaks were obtained from King and Klose (2017). ChIP-seq and RNA-seq data from the present study are available to download at GSE98756. Previously published studies used for analysis include mouse ES cell BioCAP (GSE43512, [Long et al., 2013b]), Kdm2B ChIP-seq (GSE55698, [Blackledge et al., 2014]), Kdm2A ChIP-seq (GSE41267, [Farcas et al., 2012]), H3K27me3 ChIP-seq (GSE83135, [Rose et al., 2016]), H3K4me3 ChIP-seq (GSE93538, [Brown et al., 2017]). Nature Reviews Molecular Cell Biology 16:155–166. Molecular and Cellular Biology 37:e00626-16. Molecular and Cellular Biology 30:2437–2448. Cold Spring Harbor Perspectives in Biology 5:a018648. Current Opinion in Genetics & Development 16:455–462. Nature Structural & Molecular Biology 17:194–201. Nature Structural & Molecular Biology 15:1169–1175. International Journal of Molecular Medicine 14:1109–1114. Trends in Biochemical Sciences 31:89–97. Journal of Biological Chemistry 276:44669–44676. Journal of Biological Chemistry 276:7169–7175. Critical Reviews in Biochemistry and Molecular Biology 48:575–608. Nature Reviews Drug Discovery 13:889–903. Nature Structural & Molecular Biology 20:611–619. Molecular and Cellular Biology 20:2108–2121. Biochimica et Biophysica Acta (BBA) - Molecular Cell Research 1833:2757–2764. European Journal of Cell Biology 77:151–160. Thank you for submitting your work entitled "FBXL19 recruits CDK8-Mediator to CpG islands and primes developmental genes for activation during lineage commitment" for consideration by eLife. Your article has been reviewed by four peer reviewers, one of whom is a member of our Board of Reviewing Editor and the evaluation has been overseen by a Senior Editor. The reviewers have discussed the reviews with one another and the Reviewing Editor has drafted this letter to crystallize our concerns going forward. The work presented was deemed important and interesting but key issues reduced enthusiasm for the manuscript considerably. Given that these revisions are substantial and likely to take a significant amount of time, we are currently declining the present version of the paper. That said, if you feel you can successfully address all the concerns raised, we will be open to consider a revised submission, which would be treated as a de novo submission but sent to the same editors and, if possible, referees for re-assessment. The reviewers considered the manuscript to be strong, reporting a thorough characterization of FBXL19, the least-well studied of three proteins that contain a ZF-CxxC domain. The authors demonstrate that over-expressed FBXL19 accumulates in the nucleus, and that a majority of its genome-wide binding is at sites associated with CpG islands. 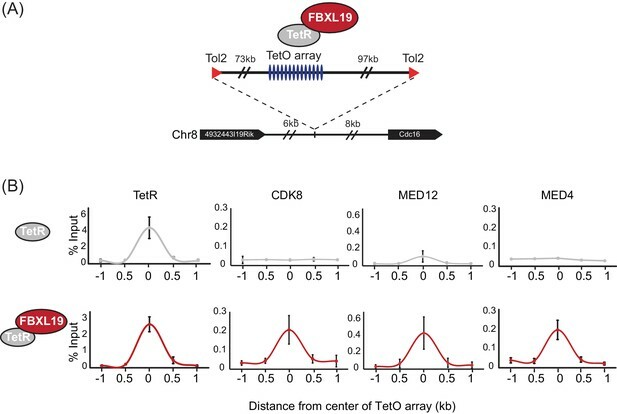 Affinity purification of FS2-tagged FBXL19 indicated a physical association with CDK8-containing Mediator complex, and a TetR-FBXL19 fusion protein was able to recruit CDK8 to a chromosomally-integrated artificial TetO array, suggesting that FBXL19 can recruit CDK8 to chromatin. Conditional deletion of the ZF-CxxC domain of FBXL19 led to reduction of CDK8 binding at CpG islands in ES cells. Many of these sites are associated with silent developmental genes that are no longer activated during ES cell differentiation in the FBXL19 mutants. Finally, deletion of the ZF-CxxC domain was shown to be embryonic lethal in mice. Together, these findings suggest that FBXL19 may prime developmental genes for subsequent activation during differentiation, possibly involving recruitment of CDK8. Overall, this represents an interesting finding and potentially a novel role for CDK8. However, concerns about the degree to which this represents a significant advance over previous FBXL19 studies, some missing controls, and a lack of a direct test of CDK8 requirement for expression of these genes resulted in lessened enthusiasm for this manuscript. The reviewers discussed these concerns and summarized their critiques into the following points. 1) A key conclusion of the manuscript is that CDK8-Mediator is required for induction of developmental genes regulated by FBXL19, but this is actually not proven in the manuscript. The authors should deplete CDK8 (and/or CDK19, see comment #2 below) and test for the impact on induction of FBXL19-dependent genes. 2) Throughout the paper, the authors refer to CDK8-Mediator. Given that there are two paralog kinases associated with the Mediator complex, CDK8 and CDK19, the authors should test for the presence of CDK19 and clarify whether the interaction is exclusive to CDK8-containing complexes or not. In Figure 2A, are the CDK8 peptides identified unique to CDK8 or could they map to CDK19 as well? In Figure 2C, please add western blot for CDK19. As for point #1 above, is CDK19 required for control of FBXL19-regulated genes? Additionally, the authors should demonstrate that in the "EV" control lane, at the similar molecular weight, these candidate hits didn't show up in the cut gel, or at least with significantly less numbers of peptides. 3) If the ZF-CxxC mediates the interaction between FBXL19 and chromatin, then which functional domain(s) on FBXL19 bind to CDK8-Mediator complex? Lee et al., claimed that the F-box is critical for the interaction between FBXL19 and RNF20. Does the same protein structure bind to CDK8? 4) Most of the findings are based on overexpression of FBXL19 – what is the level relative to endogenous FBXL19? High-level over-expression could drive nuclear accumulation and other observations (including Figure 3). Authors should provide data demonstrating the degree of overexpression produced in the key experiments. 5) FBXL19 binding to CpG islands and its requirement in ES differentiation has been described previously: (https://www.ncbi.nlm.nih.gov/pubmed/28453857) "Our genome-wide target mapping unveils the preferential occupancy of Fbxl19 on CpG island-containing promoters […]" "Moreover, we reveal that Fbxl19 is critical for proper differentiation of ES cells […]" With respect to this, the authors should clarify the novelty of their results presented in the current manuscript. 6) The conclusion that FBXL19 does not appear to regulate CDK8-Mediator levels is not fully supported by the data. Figure 2—figure supplement 1H needs to be repeated so that CDK8 bands are not over-exposed as there does appear to be a change in amount/mobility when overexpressed -/+ MG132. Furthermore, there seems to be a noticeable increase of MED12 protein upon FBXL19 overexpression, which was even more obvious when cells were treated with MG132. 7) In Figure 4, CDK8 recruitment has only been tested for the FBXL19 ZF-CxxC deletion -is this recapitulated for depletion of the whole protein? Given that Figure 4B appears to show a decrease in the levels of the deletion protein this is an important point to verify. 8) The authors need to show that OHT treatment of the delCxxC ES line leads to reduced binding of FBXL19 in conditions used for CDK8 ChIPseq -several genes would be ok -these same genes should be used to validate CDK8 CHIPseq signal. 9) Supplemental tables with differential gene expression results should be provided -or at least working gene lists used to reach the conclusions in the manuscript. Full GO enrichment results should be included as supplementary tables so that specific gene lists can be examined. 10) Various figure panels are missing statistical tests: Figure 4C needs statistical tests, e.g. KS/Wilcoxon -See Figure 4E; Figure 4G needs statistical tests; Figure 4H and 4I need boxplots and need statistical tests eg KS/Wilcoxon as for E/F; Figure 4H-J should include FBXL19-bound groups; Figure 6B,E,F need statistical tests. 11) It is very nice that the authors showed that genome-wide chromatin binding of FBXL19 was completely lost when the ZF-CxxC domain was deleted or mutated. To further confirm that it is indeed this ZF-CxxC domain mediating interaction with the non-methylated CpG islands, some controls are necessary. For example, in Figure 1—figure supplement 1D, the authors showed that almost all of the FBXL19 binding sites are overlapped with NMIs locations, with only 93 exceptions. Then are the signals at these 93 sites also changed in the FBXL19 mutant ChIPSeq data? When the cell DNA methylation levels are modulated, will the binding pattern of FBXL19 changed accordingly? Thank you for submitting your article "FBXL19 recruits CDK-Mediator to CpG islands of developmental genes priming them for activation during lineage commitment" for consideration by eLife. Your article has been reviewed by three peer reviewers, one of whom is a member of our Board of Reviewing Editors and the evaluation has been overseen by James Manley as the Senior Editor. The reviewers have opted to remain anonymous. The revised manuscript by Dimitrova et al., is an excellent report describing the characterization of FBXL19, a member of the ZF-CxxC domain-containing family of proteins, and its role in recruiting CDK-Mediator to developmental genes in stem cells. As for other members of this family, the authors show that FBXL19 recognizes unmethylated CpGs in a ZF-CxxC-dependent manner. Unlike the lysine demethylases KDM2A and KDM2B in this protein family, FBXL19 lacks a JMJ-C domain. Instead, the authors report that FBXL19 interacts with the CDK-Mediator complex. The authors then embark on an experimental tour-de-force to demonstrate that FBXL19 is required for recruitment of CDK-Mediator to a subset of genes containing CpG islands in ES cells, mostly genes involved in lineage commitment. Interestingly, these genes are transcribed at low levels in ES cells when bound by FBXL19 and CDK-Mediator, but their induction is compromised in the absence of FBXL19. This indicates that FBXL19-CDK8-Mediator is required to 'prime' these genes in ES cells and their subsequent induction upon differentiation stimuli. Finally, the authors demonstrate that FBXL19 depletion is embryonic lethal. Overall, the manuscript is very well written, and the data is of excellent quality. 1) In AP-MS (Figure 2A), what is the background value of emPAI? Are there any other FBXL19-interacting proteins that show significantly high levels of emPAI in the list? How significant are the components of CDK-Mediator complex represented in all the hits? 2) In Figure 3, the authors demonstrated that FBXL19 was able to recruit CDK-Mediator complex, such as CDK8 and MED12, to artificially designed chromatin regions. What about CXXC-domain or F-box deletion mutants in this assay? 3) In Figure 4B, it is not very clear which band(s) are exactly indicated as full-length FBXL19 and which one(s) are CXXC deletion? Why are there double bands? Did the author use T7 antibody to detect the endogenously introduced protein? 4) In Figure 4C, what proportions of each group of CDK8 binding sites overlap with FBXL19? In theory, the author expects to see that CDK8 sites showing binding intensity changes upon tamoxifen treatment would tend to overlap more with FBXL19. 5) In Figure 4—figure supplement 1C, please use a Venn Diagram to show directly the number of peaks of CDK8, FBXI19 and NMI overlapping with each other. This would be more straightforward. 6 In Figure 5, please perform the same GSEA or functional annotation analysis on genes that are associated with unchanged CDK8 binding sites upon FBXL19 CXXC-domain deletion. 7) In Figure 6B, what is the result for genes that are associated with increased CDK8 binding signals in FBXL19 CXXC-domain deletion mutant upon RA-induced differentiation? 8) In Figure 6C, even though the authors claimed that those upregulated genes (889) in FBXL19 CXXC-domain deletion mutant upon RA treatment were not involved in developmental processes, it is still interesting to find that significantly more genes were activated upon CXXC-domain deletion. What explanation can the authors provide for this finding? 9) In Figure 7, the authors claim that FBXL19 relies on CDK-mediator complex to activate the specific set of developmental genes. Is it possible to test this hypothesis in the FBXL19 CXXC-deletion system they established in Figure 6? In wild-type ESC, depletion of MED13 will have similar effects as FBXL19 CXXC deletion, whereas in FBXL19 mutant, the effects would be much alleviated? 10) In Figure 8, why did heterozygous deletion of FBXL19 CXXC-domain show even better developmental status than the wild type? 11) The authors demonstrated that the CXXC-domain mediates the binding of FBXL19 at NMIs, where F-Box mediates its interaction with the CDK-Mediator complex. What about CDK8 chromatin binding or gene expression patterns upon F-Box deletion of FBXL19? Will the authors see the same results as what they found in CXXC-domain deletion mutant? We agree with the reviewers that testing the impact that removal of CDK-Mediator has on the induction of FBXL19 target genes is an important experiment. To disrupt CDK-Mediator we have developed a new cell system to remove MED13 and its closely related paralogue MED13L (both of which are expressed in mouse ES cells) in an inducible manner. We chose to delete both MED13 and MED13L because they are thought to play an interchangeable role in physically linking the CDK subunits to the core Mediator and to be required to form an intact CDK-Mediator complex (Kuesel et al., 2009; Tsai et al., 2013). To achieve this, we exploited gene targeting to insert loxP sites around essential exons in both MED13 and MED13L. We also engineered these cells to express a tamoxifen inducible form of Cre recombinase allowing inducible deletion of MED13/13L (Figure 7—figure supplement 1). In new Figure 7, we demonstrate that the addition of tamoxifen leads to complete loss of MED13/13L protein. Furthermore, we show by ChIP that CDK8 no longer occupies its target sites. We then examined FBXL19 target genes after loss of CDK-Mediator binding and found that they are no longer appropriately induced during differentiation (Figure 7D), in keeping with a requirement for CDK-Mediator in FBXL19dependent gene activation. We thank the reviewers for suggesting this important experiment as it now robustly supports and strengthens our key argument that FBXL19 recruits the CDK-Mediator complex to the CpG islands of inactive developmental genes to prime them for appropriate activation during differentiation. We have now edited the text throughout the manuscript to reflect these important new observations. 2)Throughout the paper, the authors refer to CDK8-Mediator. Given that there are two paralog kinases associated with the Mediator complex, CDK8 and CDK19, the authors should test for the presence of CDK19 and clarify whether the interaction is exclusive to CDK8-containing complexes or not. In Figure 2A, are the CDK8 peptides identified unique to CDK8 or could they map to CDK19 as well? In Figure 2C, please add western blot for CDK19. As for point #1 above, is CDK19 required for control of FBXL19-regulated genes? Furthermore, because the FBXL19-associated Mediator complex could contain either CDK8 or CDK19, we have edited the text throughout the manuscript to replace ‘CDK8-Mediator’ with ‘CDK-Mediator’. In future work it will be interesting to understand in more detail if CDK8- and CDK19-containing Mediator complexes have redundant or unique roles in gene activation during differentiation. CDK8/19 peptide sequences identified by mass spectrometry. 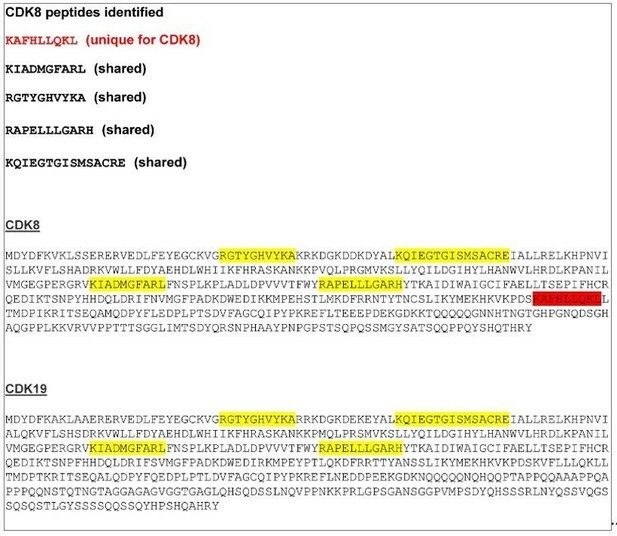 A CDK8 unique peptide is indicated in red. The other four peptides, indicated in yellow, are shared between CDK8 and CDK19. Additionally, the authors should demonstrate that in the "EV" control lane, at the similar molecular weight, these candidate hits didn't show up in the cut gel, or at least with significantly less numbers of peptides. We carried out mass spectrometry analysis on affinity-purified FBXL19 by in-solution digestion followed by LC-MS. This was to overcome the limitations inherent to cutting bands from SDS-PAGE gels and the isolation of tryptic peptides from gel slices. Importantly, we only considered a protein to be an FBXL19 interactor in our mass spectrometry analysis if it was absent from matched EV control purifications analysed using the same in-solution approach. It would have been beneficial to have described this approach in more detail in the initial submission, so we have now expanded our description of these experiments in the revised Material and Methods. Furthermore, we validated that CDK-Mediator components were not found in the ‘EV’ control purifications by Western blot analysis (Figure 2C). 3) If the ZF-CxxC mediates the interaction between FBXL19 and chromatin, then which functional domain(s) on FBXL19 bind to CDK8-Mediator complex? Lee et al. claimed that the F-box is critical for the interaction between FBXL19 and RNF20. Does the same protein structure bind to CDK8? We thank the reviewers for this suggestion and agree this is an important point. To address this, we performed transient overexpression of FBXL19 followed by co-immunoprecipitation comparing wildtype FBXL19 with versions of FBXL19 in which individual domains had been removed. We found that deletion of the F-box largely disrupted the interaction with CDK-Mediator, while removing the ZF-CxxC domain had little effect on this interaction. We have included these new observations in the revised manuscript (subsection “FBXL19 interacts with the CDK-Mediator complex in ES cells”, Figure 2—figure supplement 1E). We also attempted to determine whether the LRR domain of FBXL19 was required for this interaction but unfortunately removing this portion of the protein seemed to render it unstable (unpublished observations) limiting our capacity to draw any meaningful interpretation. We have examined FBXL19 transcript levels in the transgene lines and they are roughly eight times that of wild type (Author response image 2). Despite exhaustive efforts we have been unable to generate an antibody that recognizes the endogenous protein in cellular extracts by Western blot. Therefore, we have been unable to directly compare endogenous FBXL19 protein levels to the FBXL19 levels in transgene containing lines. Nevertheless, we are confident in the conclusions from our key experiments. We have validated that endogenous FBXL19 is in the nucleus and interacts with CDKMediator. This was demonstrated by immunoprecipitating endogenous FBXL19 protein from nuclear extracts and using Western blot to show that FBXL19 associates with CDK8 and MED12 (Figure 2—figure supplement 1D), consistent with our transgene experiments (Figure 2). Given that we know FBXL19 is in the nucleus and interacts with CDK-Mediator, tethering experiments in Figure 3 were used to test if de novo targeting of FBLX19 to naïve chromatin would result in recruitment of CDK-Mediator. This showed that FBXL19 binding was sufficient to recruit CDK-Mediator (Figure 3B), in agreement with our observations that when the capacity of FBXL19 to bind CpG island chromatin is disrupted, CDK8 is no longer appropriately recruited to a subset of CpG island-associated target genes (Figure 4). RT-PCR showing the expression levels of FS2-Fbxl19 relative to endogenous Fbxl19 in the empty vector (EV) control line. Data is the average of three biological replicates. Error bars represent standard deviation. During the preparation of our manuscript, the manuscript cited by the reviewer was published in NAR. It reported that FBXL19 occupied CpG islands and appeared to play a role in cellular differentiation. However, we would like to point out that, although our observations were similar with respect to these two points, the main discoveries resulting from our careful and systematic study are completely distinct from that of the published study. In direct contrast to the published work, we find no evidence for any connection between FBXL19 and RNF20 using unbiased biochemistry and mass spectrometry (Figure 2 and Figure 2—figure supplement 1F). Furthermore, using our conditional genetic ablation strategies we do not observe any effect of FBXL19 loss on H2BK120ub1 (Figure 2—figure supplement 1G). Therefore, we are unable to reproduce the central findings of the published study. In our opinion this severely limits and brings into question the validity and, therefore, the novelty of the published work. Our observations likely differ from those of the NAR study because we use unbiased as opposed to candidate-based (guess work) biochemistry and conditional knockout strategies as opposed to stable knockdown cell lines that are prone to indirect and secondary effects due to the long-term culture necessary for their generation. Nevertheless, we agree with the reviewer that the wording of the indicated sentences could have been more inclusive and contrasting of the published work and have clarified this in the revised manuscript (Introduction, Results section, subsection “FBXL19 interacts with the CDK-Mediator complex in ES cells” and subsection “Removing the CpG island-binding domain of FBXL19 results in a failure to induce developmental genes during ES cell differentiation”). We would also like to take this opportunity to clarify the novelty of our study and the importance of its central conclusions. (1) By using unbiased biochemical approaches, we discover a link between FBXL19 and CDK-Mediator in mouse ES cells. 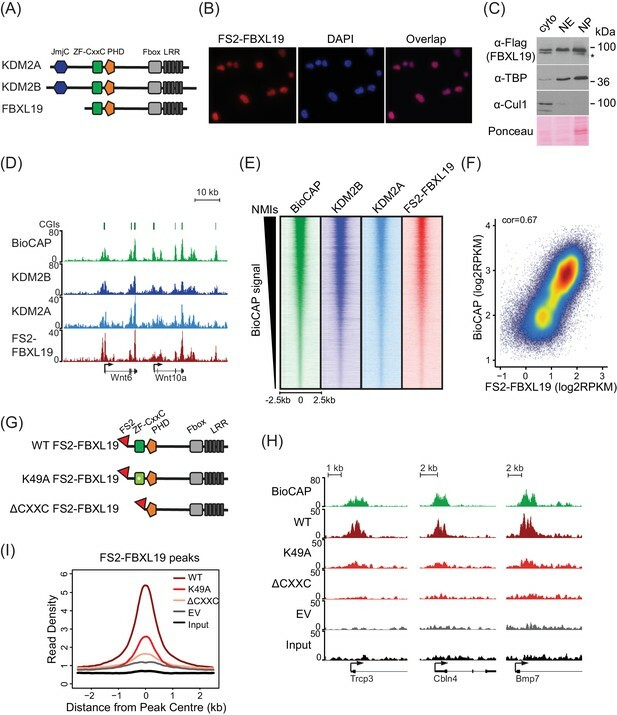 (2) Using conditional genetic ablation, de novo targeting strategies, and genomics, we go on to show that FBLX19 can recruit CDK-Mediator to chromatin and the CpG island promoters of silent developmental genes in ES cells. (3) In the absence of FBXL19, these genes are no longer appropriately activated upon differentiation, providing an explanation for why normal differentiation cannot be achieved in the absence of FBXL19. (4) In the revised study, based on the reviewer’s suggestions (point 1), we now demonstrate that FBXL19 target genes also rely on CDKMediator for their activation, validating our biochemistry and genomics. (5) Finally, we discover that loss of FBXL19 leads to abnormal development and early embryonic lethality, in agreement with the inability of cells to appropriately regulate gene expression during development. Therefore, our discoveries are novel in describing a completely new modality by which FBXL19 and CpG islands prime genes for future expression. Furthermore, we provide compelling new evidence that CDKMediator can be recruited to gene promoters independently of classical transcription factors and transcription itself to prime CpG island-associated genes for activation. These new discoveries force us, and the field, to think differently about how CpG islands integrate and regulate gene expression, while also provide new insight into the poorly understood mechanisms by which CDK-Mediator is targeted to genes and functions to control gene expression. We believe these important points are now more clearly framed in the revised manuscript. 6) The conclusion that FBXL19 does not appear to regulate CDK8-Mediator levels is not fully supported by the data. Figure 2—figure supplement 2H needs to be repeated so that CDK8 bands are not over-exposed as there does appear to be a change in amount/mobility when overexpressed -/+ MG132. Furthermore, there seems to be a noticeable increase of MED12 protein upon FBXL19 overexpression, which was even more obvious when cells were treated with MG132. We have repeated these experiments based on the reviewer’s suggestions. We again failed to observe any significant difference in CDK8 protein levels following FBXL19 over-expression at lower exposure levels. We agree it appeared that MED12 levels may have increased slightly when FBXL19 was overexpressed in original Figure 2—figure supplement 1G. However, we believe this is an artefact resulting from inefficient transfer on the left had side of the gel. MED12 is a large protein (250KDa) and we previously have encountered difficulties efficiently transferring MED12 to membrane for Western blot analysis. We have now optimised our transfer of large proteins and fail to see any significant or reproducible alterations in MED12 levels (Figure 2—figure supplement 1H). MED12 is known to be regulated by the proteasome in ES cells (e.g. Buckley et al., 2012). In agreement with this, we observe an increase in MED12 levels after MG132 treatment in both FBXL19 overexpressing cells and in the control cells transfected with an empty vector. This effect is therefore not related to FBXL19. Finally, we have also included in the revised manuscript a Western blot analysis of MED13 (which is also part of the CDK module) and again we observe no change in protein levels following FBLX19 overexpression (Figure 2—figure supplement 1H). We conclude that FBXL19 does not regulate CDK module protein levels. All commercially available antibodies for FBXL19 that we have tried fail to ChIP FBXL19 and our exhaustive attempts to generate our own FBXL19-specific antibody that works for ChIP have been unsuccessful (two separate epitopes and 4 rabbits). This has precluded us from carrying out the proposed experiment. However, we do observe a uniform loss of FBXL19 binding when the ZF-CxxC domain is removed in epitope-tagged transgene experiments (Figure 1) suggesting that FBXL19 binding to CpG islands relies on an intact ZF-CxxC domain. This information is now included as Supplementary file 1. We have now included the necessary statistical tests and plots as requested by the reviewer. As suggested by the reviewer, we divided all CDK8 peaks into those which have FBXL19 (FBXL19+) and those that do not have FBXL19 (Fbxl19-). We then examined FBXL19, BioCAP and CDK8 enrichment in these groups (Figure 4—figure supplement 1I). As observed when we analysed all CDK8 peaks (Figure 4H-J), we found that CDK8 peaks that are bound by FBXL19 have increased levels of FBXL19, CDK8, and BioCAP signal when compared to sites not bound by FBXL19. Furthermore, sites that rely on FBXL19 for CDK8 binding have broader peaks of FBXL19 enrichment. This is consistent with the fact that these are large CpG islands with broad BioCAP signal (Figure 4F, 4H). The majority peaks that show reduction of CDK8 binding in FBXL19ΔCXXC ES cells with FBXL19 peaks (519/783) while there is only a small overlap between FBXL19 binding and sites with increased CDK8 binding (90/379). We have now included this information in Figure 4—figure supplement 1I. Figure 6B,E, F need statistical tests. We have now included the necessary statistical tests. We have now compared the enrichment of WT FBXL19 and ΔCxxC FBXL19 at these 93 sites (Author response image 3A), which corresponded to regions that were not associated with NMIs and observed a loss of binding of ΔCxxC FBXL19 (Author response image 3B). Importantly, these same 93 sites also show some BioCAP signal, albeit at a level much lower than is observed at NMIs. This suggests that these sites are very weak CpG islands which were not captured in our NMI peak set due to their low Bio-CAP signal. Furthermore, to illustrate the relationship between FBXL19 binding and CpG-rich non-methylated DNA, we have examined BioCAP and FBXL19 signal across all ATAC-seq peaks in the mouse ES cell genome (Author response image 3B). ATAC-seq peaks represent a combination of regulatory elements that are CpGrich (CpG islands) or CpG-poor (usually distal regulatory elements). This provides the necessary contrast to illustrate the correlation of FBXL19 tracks with sites that contain CpG rich non-methylated DNA (BioCAP), consistent with a FBXL19 binding modality that is dependent on its ZF-CxxC domain. We have not been able to examine FBXL19 binding in cells with altered DNA methylation levels as this would require recreation of a DNMT1 (or DNMT3A/B) null situation in our transgene containing cell line (we don’t use 5aza-C for this purpose as it causes extensive DNA damage due to covalent adducts which are formed between DNA and DNMT enzymes). However, when we have previously examined DNA methylation-deficient cells and the behaviour of the closely related KDM2A/B proteins, which have nearly identical CpG island binding patterns to FBXL19 (Figure 1D and 1E), we demonstrated that KDM2A/B occupancy is completely dependent on recognition of CpG-rich non-methylated DNA (Blackledge et al., 2010; Zhou et al., 2012). (A) A Venn diagram showing the overlap between FBXL19 peaks and NMIs; (B) Metaplot analysis of enrichment of WT FS2-FBXL19, ΔCxxC FS2-FBXL19, and EV control at FBXL19-occupied NMIs (solid line) and nonNMI (dashed line) regions; (C) Heatmaps showing enrichment of BioCAP, WT FS2-FBXL19, ΔCxxC FS2FBXL19 and EV control at DNA accessible regions measured by ATAC-seq. To clarify these points, we have now included a table in the supplementary information (Figure 2—source data 1) detailing the AP-MS results. This includes the biological replicate FS2-FBXL19 purifications and matched empty vector (EV) controls. We limited analysis of our AP-MS data to proteins that were uniquely identified in the FBXL19 purifications (i.e. not the EV control). We have included a column highlighting the proteins that were identified in this screen and their associated emPAI scores in Supplementary file 1. Importantly, Mediator components feature heavily in this table, which is what prompted us to examine CDK-Mediator as a possible interaction of functional relevance. We have yet to validate whether other proteins in this table are bona fide interactors and, therefore, their relationship with FBXL19 and its function is not known. In these experiments we purposely used a version of FBXL19 in which the CxxC domain has a single substitution mutation (K49A) that prevents CpG island binding. We designed the experiment in this way to prevent the TetR-fusion protein from binding to CpG islands throughout the genome. This allowed us to focus our analysis on the artificial nucleation site. Although we have not tested a version of FBXL19 with its CxxC domain deleted, we believe that it would function in a very similar way to the K49A mutant as both proteins are deficient in CpG island binding and we have shown that ΔCxxC-FBXL19 retains its interaction with CDK-Mediator (Figure 2—figure supplement 1E). In all of our artificial tethering experiments we generate clonal stable cell lines expressing the TetR-fusion proteins to ensure uniform expression within lines and comparable expression across test lines. Despite exhaustive efforts, we have been unable to generate stable cell lines expressing FBXL19 lacking the F-box. 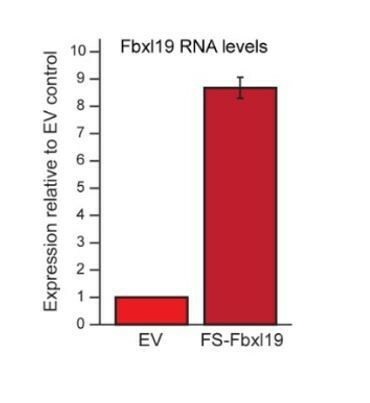 We are unsure why this is the case but speculate that FBXL19 without the F-box may be unstable or lead to a dominant negative influence that affects cell growth (negative selection). Therefore, we have not been able to examine how the F-box deletion behaves in our tethering experiments. Given that ΔF-box-FBXL19 does not interact with CDK-Mediator in transient overexpression IP experiments (Figure 2—figure supplement 1E), we assume that CDK8 and MED12 would not be recruited to chromatin by TetR-ΔF-box-FBXL19. However, we have been unable to directly test this possibility. We generated the T7 knock-in FBXL19 ES cell line (Figure 2—figure supplement 1B, C) in order to detect FBXL19 by Western blot. We observe ‘double bands’ for FBXL19 and speculate that this may be due to post-translational modification. The closely related KDM2A and KDM2B proteins are also extensively post-translationally modified leading to doublets when examined by Western blot. Following tamoxifen treatment of Fbxl19CxxCfl/fl cells to remove the CxxC domain, we observe a reduction in mobility for these double bands (with the top band shifting to the previous position of the bottom band). We have now clearly indicated which bands represent WT and ΔCxxC FBXL19 in Figure 4B and have described this in the figure legend. The overlap of each group of CDK8 peaks with FBXL19 peaks is shown in Figure 4—figure supplement 1H. While roughly 41% of all CDK8 peaks overlap with FBXL19 peaks, the overlap of down-regulated CDK8 peaks is about 66%. This is highlighted in the text in subsection “FBXL19 is required for appropriate CDK8 occupancy at a subset of CpG island-associated promoters”. On the other hand, we observed that only 23% of up-regulated CDK8 peaks overlap with FBXL19 peaks. We chose to represent CDK8 enrichment at FBXL19 peaks as a heatmap in order to circumvent the limitation of peak-calling. However, as suggested by the reviewer, we have now also included a Venn diagram that shows that 89.4% of FBXL19 peaks overlap with CDK8 peaks and NMIs (Figure 4—figure supplement 1D) and mentioned this in the text (subsection “FBXL19 is required for appropriate CDK8 occupancy at a subset of CpG island-associated promoters”). We have now included the GO analysis for genes associated with unchanged CDK8 binding in Figure 5—figure supplement 1. This revealed a broad range of terms associated with basic molecular processes in line with Mediator being implicated as a key regulator of transcription. We now highlight this observation in the text in subsection “FBXL19 targets CDK8 to promoters of silent developmental genes in ES cells”. We have compared the expression of genes associated with an increase in CDK8 binding in Figure 6—figure supplement 1E. While we observe no overall difference in the expression of these genes in ES cells, there is a slight increase upon RA-induced differentiation (p-value 0.04). This is consistent with Mediator playing a role in gene transcription. 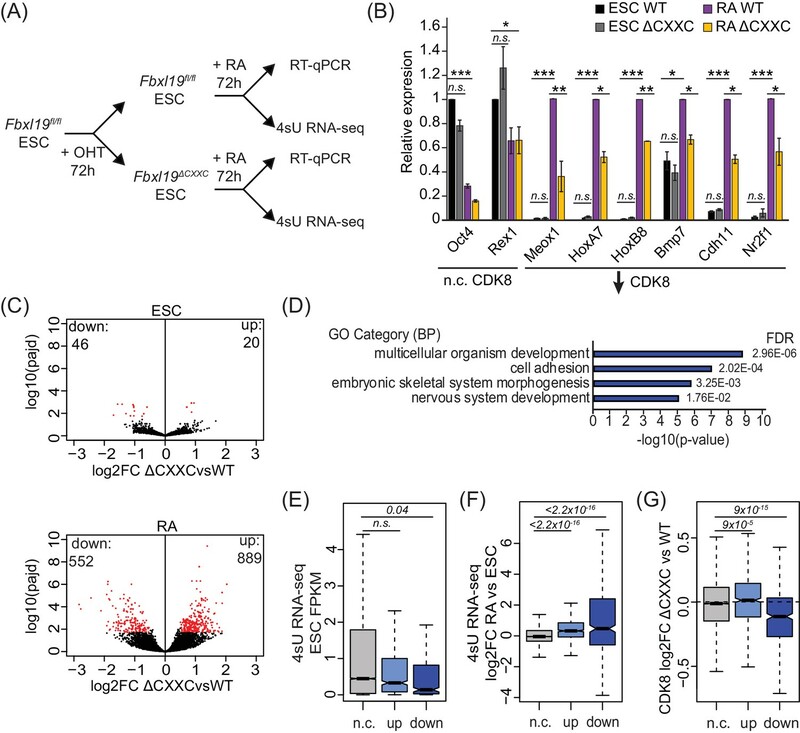 We agree with the reviewer that a significant number of genes were more activated in the Fbxl19ΔCxxC cells compared to wild type cells upon RA-induced differentiation and that this is potentially interesting. We have yet to find a compelling molecular explanation to link FBXL19 directly to these effects on gene expression. It remains possible that these gene expression changes are due to secondary transcriptional defects that manifest when cells attempt to execute a new expression programme in the absence of normal activation of silent, lineage commitment-associated genes when FBXL19 is not functional, or that FBXL19 plays other, as yet unidentified, roles in inhibiting gene expression. We have now added a sentence drawing attention to these points in the revised manuscript in subsection “Removing the CpG island-binding domain of FBXL19 results in a failure to induce developmental genes during ES cell differentiation”. One could test whether inducible MED13/13L deletion in the Fbxl19CxxCfl/fl background would not lead to any further effect on gene activation. However, this would require a significant amount of time to generate and characterise a new Med13fl/fl, Med13lfl/fl, and Fbxl19CxxCfl/fl cell line. While this is an interesting experiment, we believe that the robust and extensive series of observations in Figure 6 and Figure 7 more than adequately support our conclusion that FBXL19 target genes rely on CDK-Mediator for activation during differentiation. We have not observed any significant difference between WT and heterozygous mutant embryos. It is common to have some stage variations until around 12 dpc, even within embryos of the same litter. Therefore, we often find small differences in size and developmental status among embryos regardless of genotypes. Both the WT and heterozygous mutant embryos presented in Figure 8 appear healthy with normal development for this stage. On the other hand, the defects observed in the homozygous Fbxl19ΔCxxC embryos cannot be explained by such stage variations. 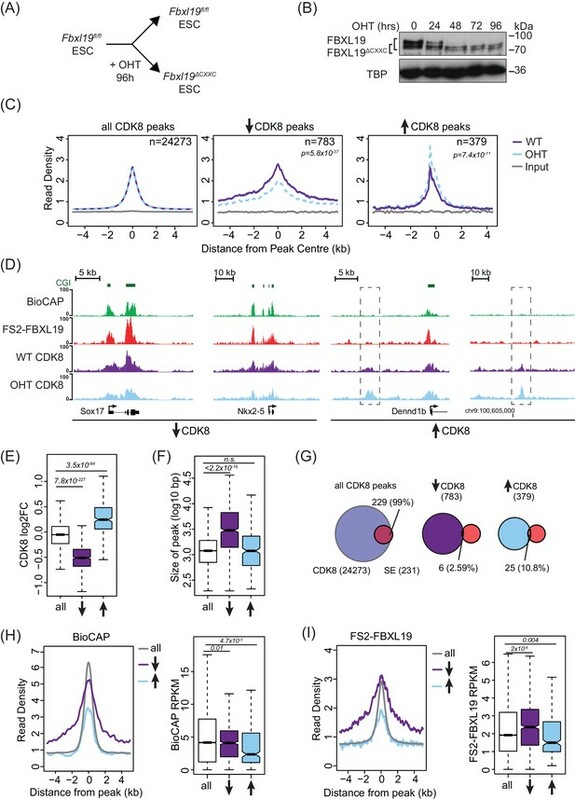 This is an interesting experiment and we hypothesize that disrupting the interaction between CDK-Mediator and FBXL19 via deleting the F-box domain would yield similar results to removing the CxxC domain. However, as described above in response to reviewer point 2, despite exhaustive efforts we have been unable to generate cell lines stably expressing FBXL19 with a deletion of the F-box, precluding us from addressing this point. It will be interesting in future work to see if we can engineer a cell line where we are able to remove the F-box in an inducible manner and examine the effects on CDK8 binding and induction of gene expression. We thank Anne Turberfield for help with the 4sU-RNAseq protocol and useful discussion, and Hamish King for assistance with computational analysis and critical comments and suggestions. We thank David Brown for initiating the FBXL19 experiments, and Anne Turberfield and Neil Blackledge for critical reading of the manuscript. We thank Ed Hookway and Udo Oppermann for sequencing support on the NextSeq500 at the Botnar sequencing facility in Oxford. Work in the Klose laboratory is supported by the Wellcome Trust, the Lister Institute of Preventive Medicine and the European Research Council. TK and HK are supported by the AMED-CREST programme from the Japan Agency for Medical Research and Development. AF is supported by a Sir Henry Wellcome Postdoctoral Fellowship. © 2018, Dimitrova et al.